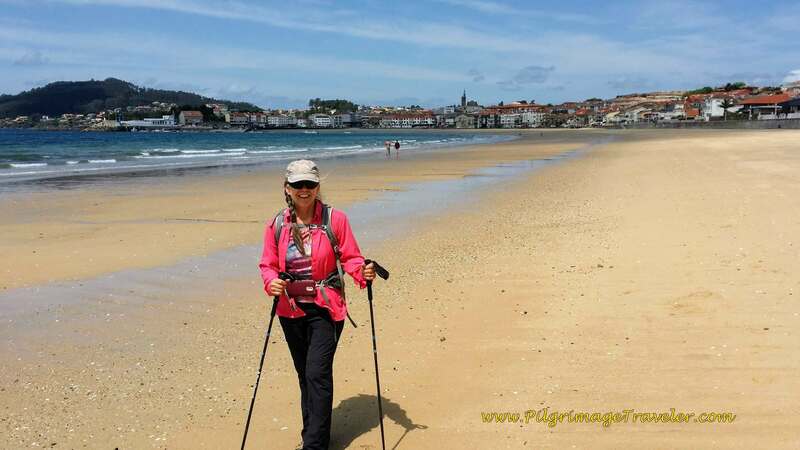 On our day eighteen on the Camino Portugués we blazed our way on the Senda Litoral, actually walking on the long, flat beaches and connecting with the sea! 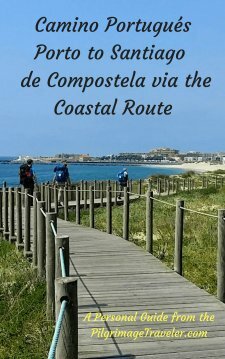 The traditional Coastal Route merely parallels the coastline, but never actually walks by it on any beaches nor any boardwalks like the Senda Litoral. I did not want a repeat of day seventeen, so we chose the seacoast. 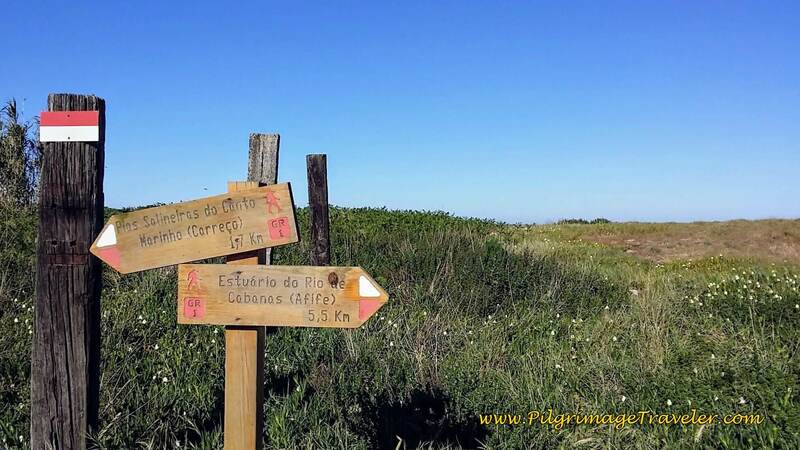 As you will see, we got specific directions from the hospitalero at the Albergue de Peregrinos de São João da Cruz dos Caminhos the night before, for the route along the Senda Litoral that is not well-waymarked, not on nice boardwalks, but IS on nice paths through the dunes. It was a bit of discovery and adventure, which wasn't all that hard, but what we loved! 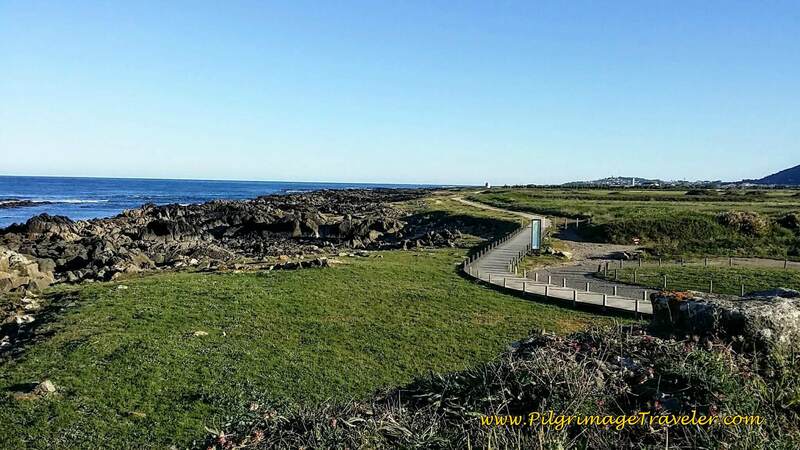 Pay close attention to our route between the small fort called the Forte de Paçô and the Gelfa Beach, the Praia da Gelfa, if you want to use this part of the Senda Litoral. That way you will not have to rely on a hand-scribbled note from anyone! 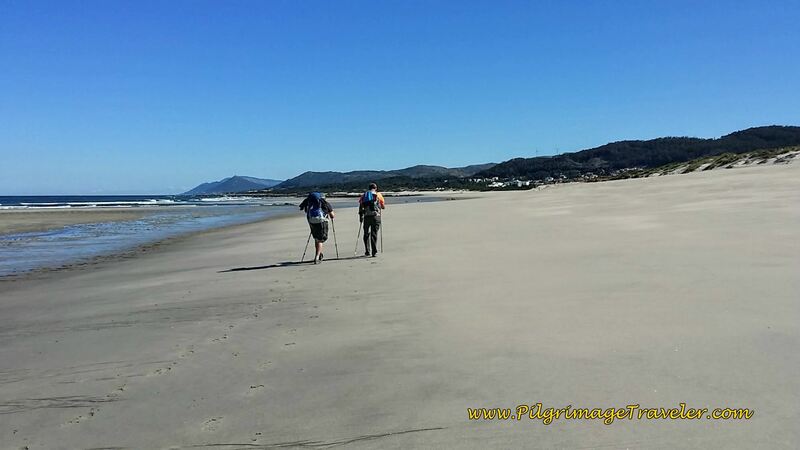 By the time you reach Âncora, the Senda Litoral joins the Coastal Route and you are home free with lots of waymarks after that. Here are our GPS tracks, for you so you can follow along. If you are a bit more tech savvy, you can download the GPS tracks from the Google Map below, then upload it to a compatible geotracker app on your smart phone! It is very easy to do, and will help ensure that you will not get lost. 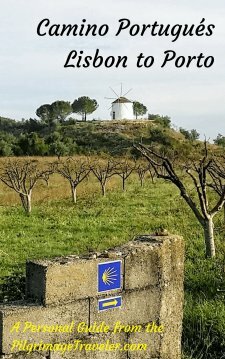 I placed the albergues/hotels/cafés on the maps that we visited. For a complete list of accommodations, click here. 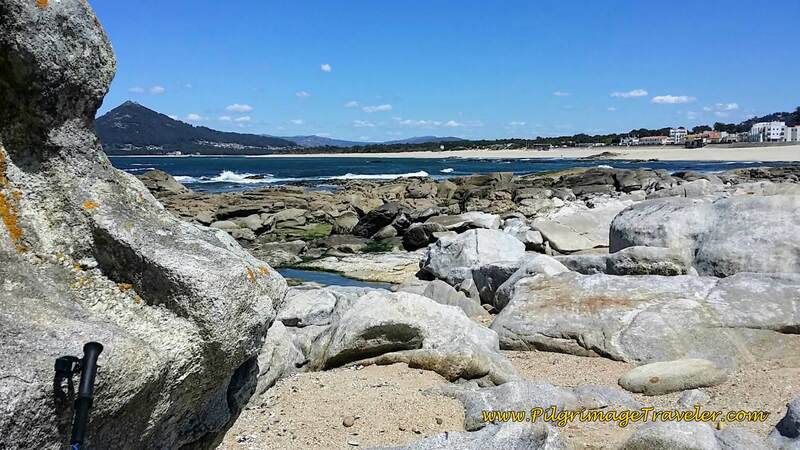 For a link to places to stay/reserve in Viana do Castelo and Caminha, click on the desired town. The day's elevation is essentially flat as you would expect along the coast on the Senda Litoral. 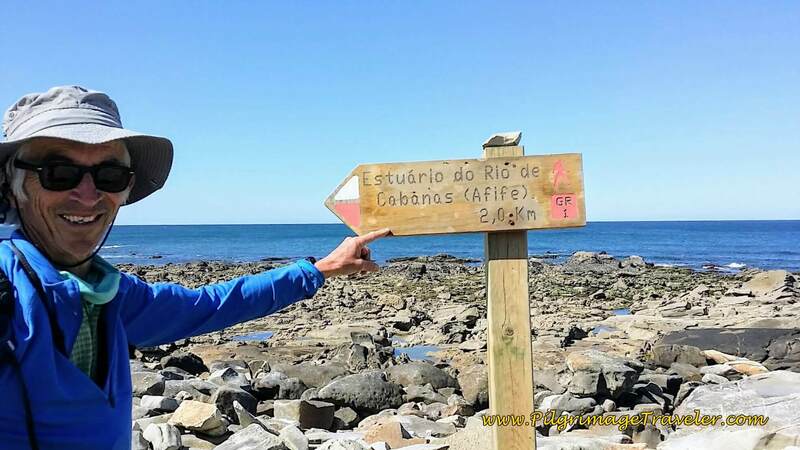 However, there is small climb up and over a coastal hill in Montedor, near Carreço and then another climb of 100 feet (30 meters) up over some dunes, just after crossing the Rio Âncora on the boardwalk, near the city of Âncora. The Albergue de Peregrinos de São João da Cruz dos Caminhos was cramped and crowded and we just wanted to get out of the there as quickly as possible. We did not have breakfast, but quickly dressed and left the place. We were going to find an open café ASAP. We were lucky, as you can see from the map above, and found a bakery almost immediately along the waterfront by the Hotel Jardím. 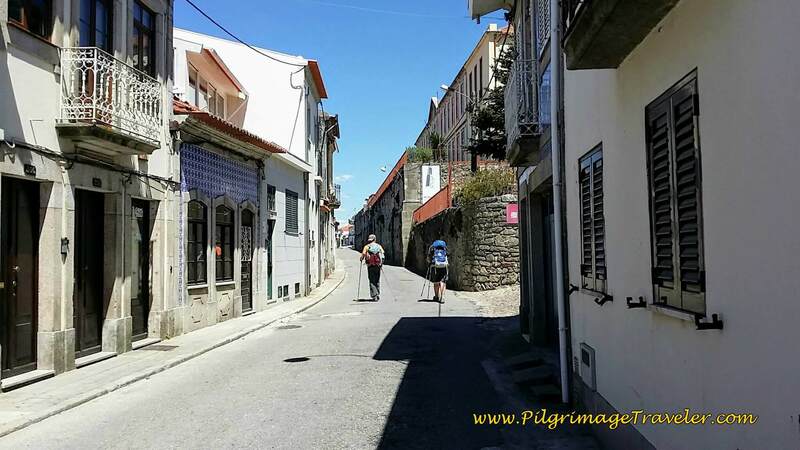 After leaving the Albergue, we walked down the Rua da Bandeira and turned left onto the Avenida 25 de Abril that runs in front of the Igreja do Carmo and heads south toward the waterfront. As soon as was possible we took an immediate right to walk under the bridge and and toward the park called the Jardim da Marginal, along the Limia River. Here is the last look at the Igreja do Carmo from just after the underpass, with the first light of day illuminating its steeple. We chose to walk down the middle of the park and through its inviting trees. 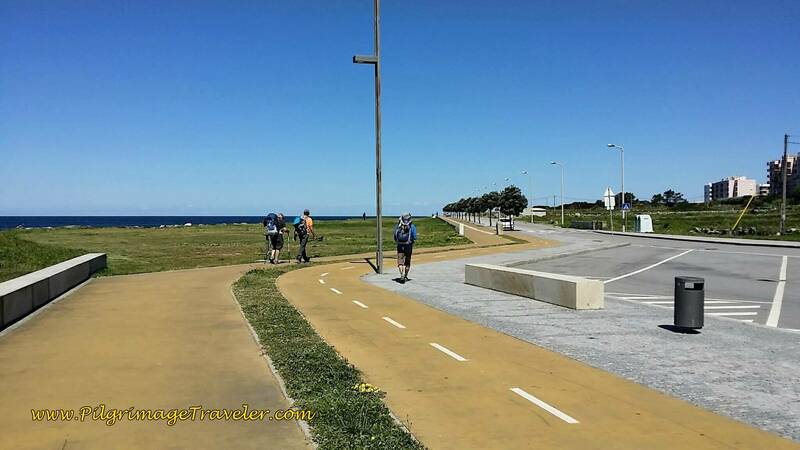 If you are taking the Coastal Route, it turns right before this park, and then left on the Rua Gontim to walk through town and eventually turn northward to walk inland. 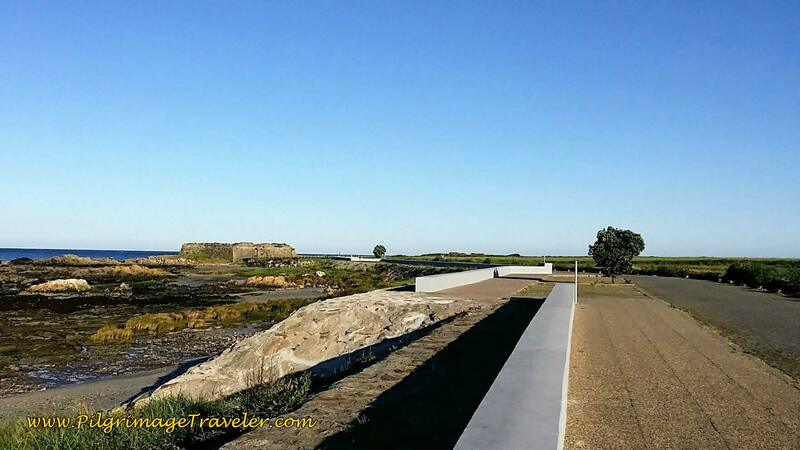 We chose to continue along the waterfront on the Senda Litoral. Shortly after the park, we found our bakery to have café con leite and some delicious sweet bread. It was open early at 0700, and if you are walking through here later, there are many cafés along the waterfront, which may be open. 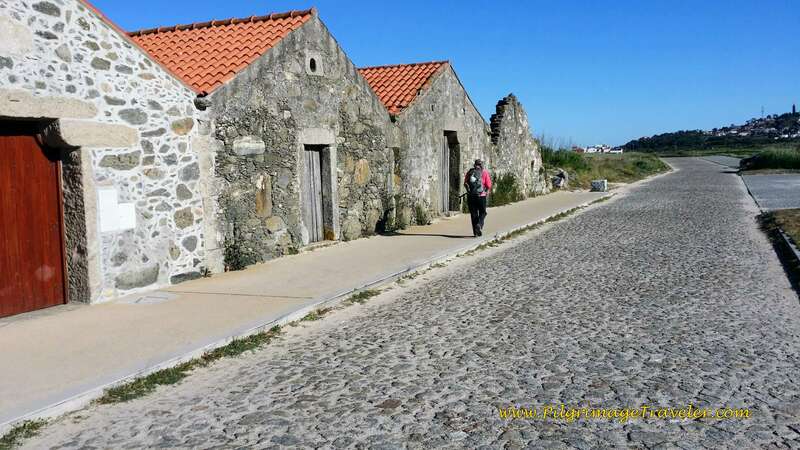 ...until we came to this fortress, the Castelo Santiago da Barra close to the mouth of the harbor in about 1.8 kilometers from our start. 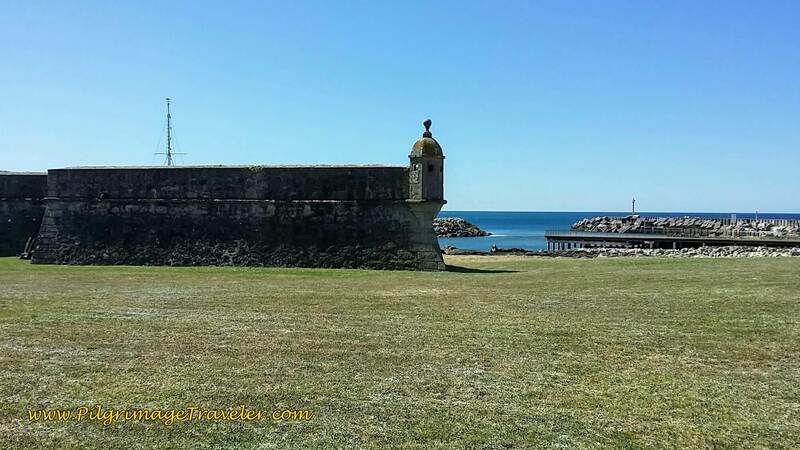 There is no clear way past this fortress toward the sea, because the shipyards are in the way, so instead take the road here where it takes a big bend to the north by the fortress, and becomes the Avenida Campo do Castelo. 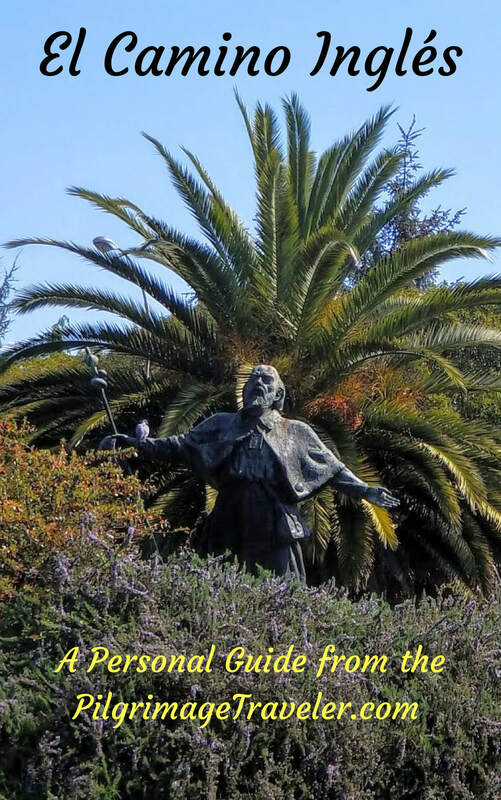 As you turn north, there is a huge park to your left where the weekly market/fair is held, and the Capela de Nossa Senhora da Agonia is ahead in the distance. Keep on walking on this avenida towards the church. We then cut across this park on a diagonal, in front of the church, north-westward and towards the sea, to skirt the shipyards. On the left (west) side of the church, you can pick up the Avenida do Atlântico, and it's a straight shot toward the coast. 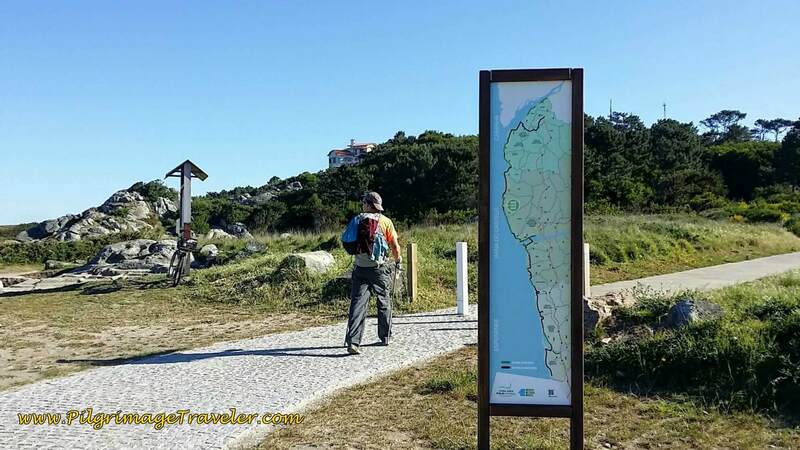 This is the most efficient way we found through town and to the coast on the Senda Litoral. After a long 700 meters straight on the Avenida do Atlântico, through an ugly industrial stretch, you come to a large roundabout at the edge of the sea. 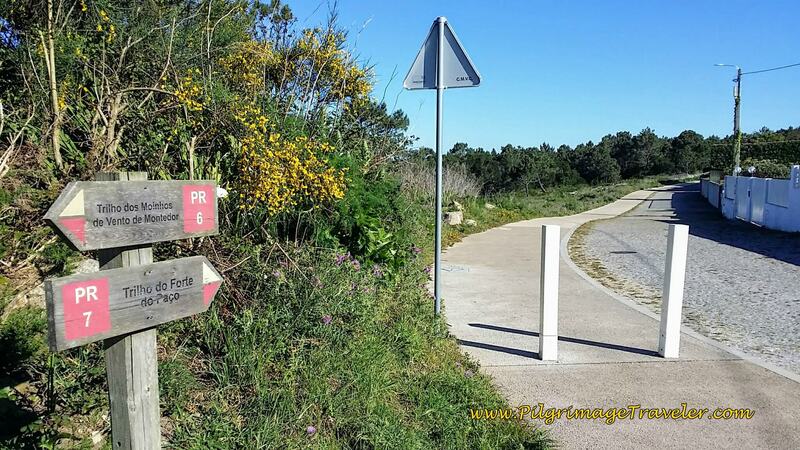 Turn right, or northward onto the Avenida de Figueiredo to join the coastal road. At anytime it feels appropriate, cut farther westward and onto the street called the Marginal. This is the road directly on the coastline, which has a nice path alongside for walking. Or just take the 2nd right at the roundabout to pick it up. 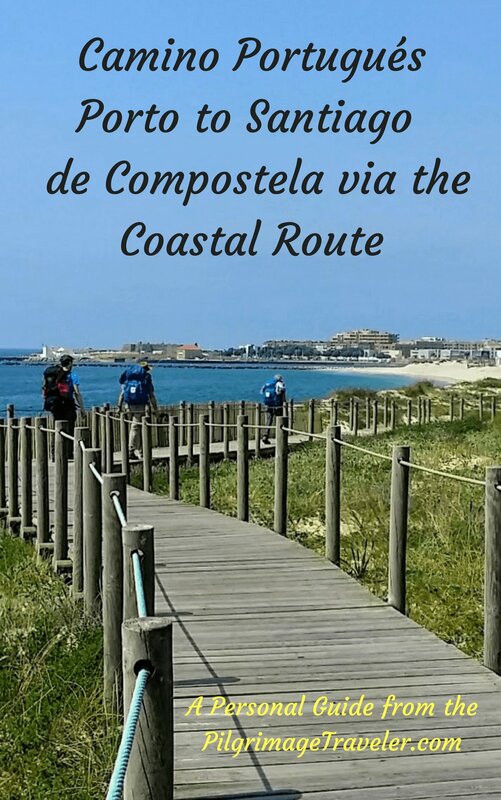 There is no real beach along this stretch after a very small one initially, so you are almost walking directly on the coast when walking on the Marginal. We ended up in a field, because we didn't turn onto the Marginal soon enough. (You can see this on our GPS tracks if you look closely). 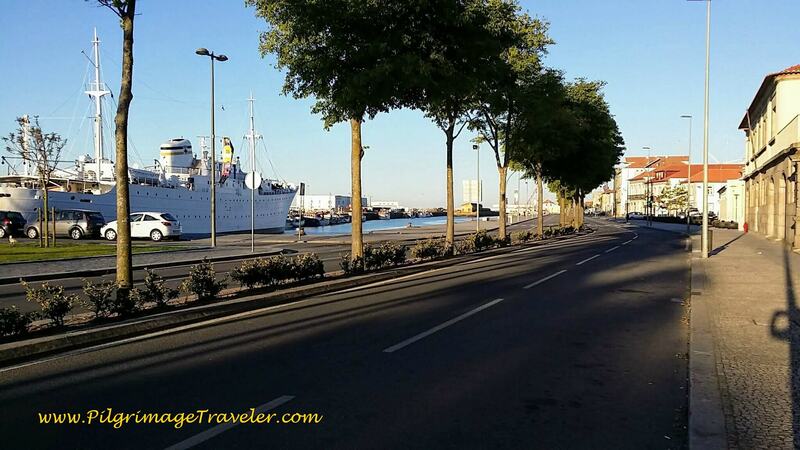 You will see this Portuguese word, "marginal" frequently to describe something right next to a waterfront. 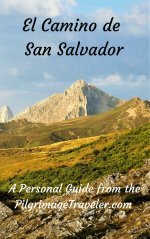 This is a useful word to know on the Senda Litoral! Thus far, without yellow arrows, we had made our way just fine, just heading towards the sea, keeping the water to our left as much as possible! 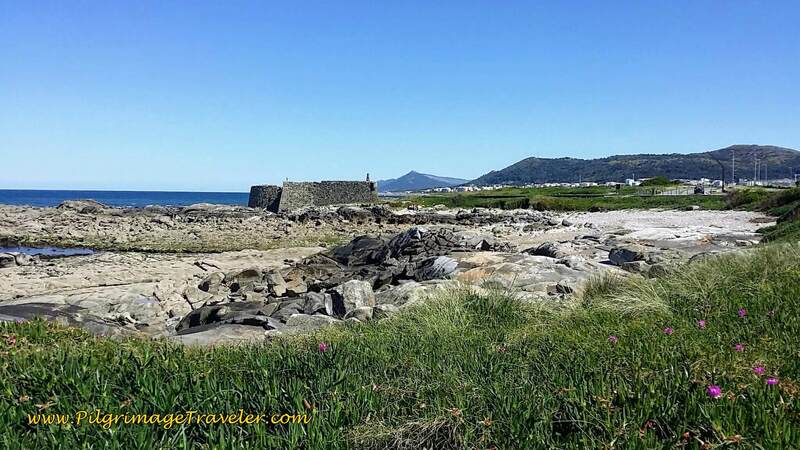 At the next point in the coastline, about a kilometer onward, you reach the small fort, the Forte de Rego de Fontes, built in 1703. 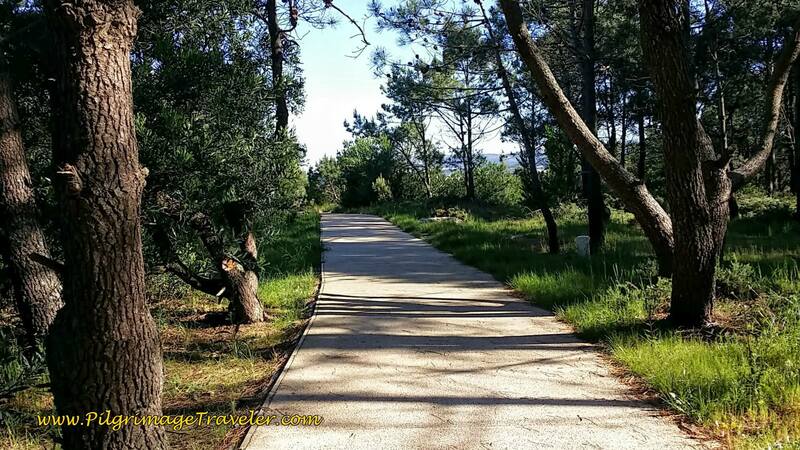 The pathway becomes a boardwalk around this nice diversion. We climbed up on the walls, and I photographed Rich on the seaward side. The boardwalk continues and in the distance you can see one of the nice information boards for the seaside walk to come and the first windmill still far off. 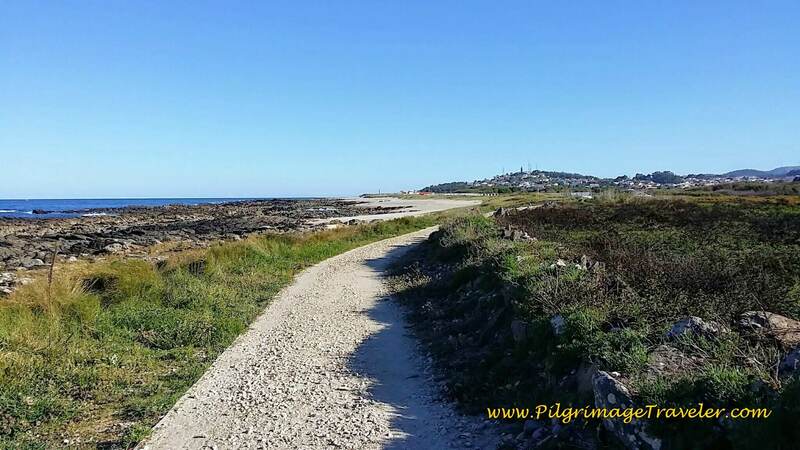 While this is not waymarked as a Camino, the paths along the coast makes it impossible to get lost in this section. 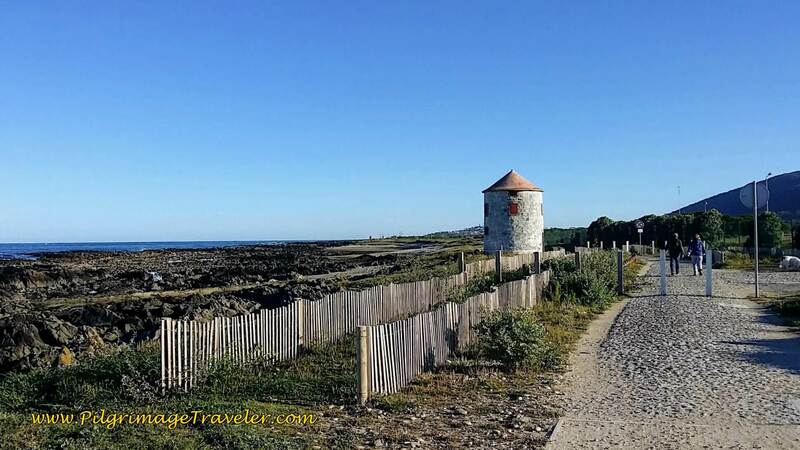 In 700 meters after the small fort, you come to the first old windmill on a path that changes from boardwalk to dirt to cobblestone. 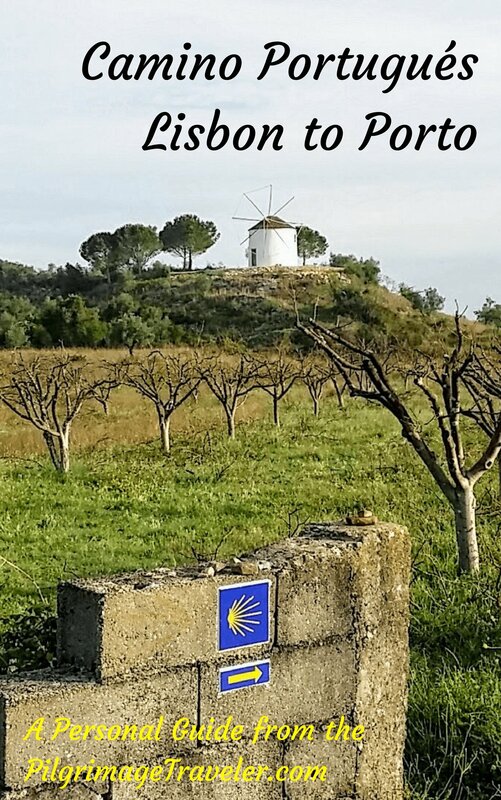 In another 700-800 meters you walk by a huge sports soccer complex for the town of Areosa, and the next old windmill is adjacent to the soccer field. As we passed the soccer complex, there are three old windmills in a row ahead. it was a very picturesque sight. 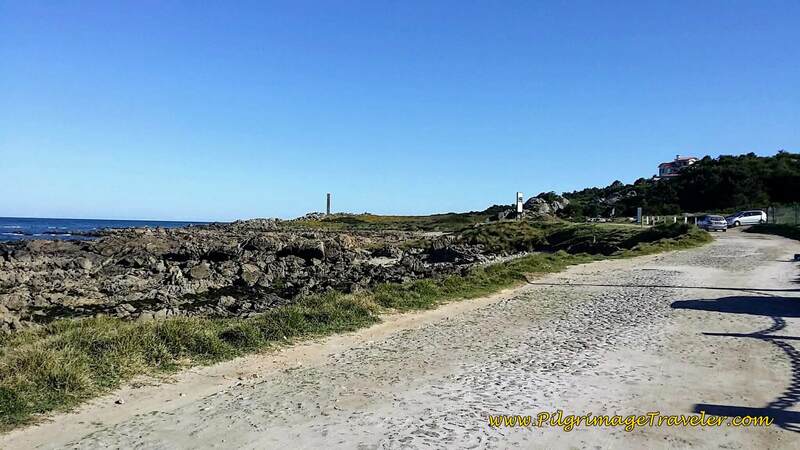 The coastline is rugged and without beaches along this section, until the Praia do Marco Branco, a few hundred meters after the 3rd windmill. We crossed a small estuary after the first windmill and our reflections in the water caught our eye. Walking toward the final windmill, the Way was a gravel road, with the Northern Coastal Route well signposted, below. 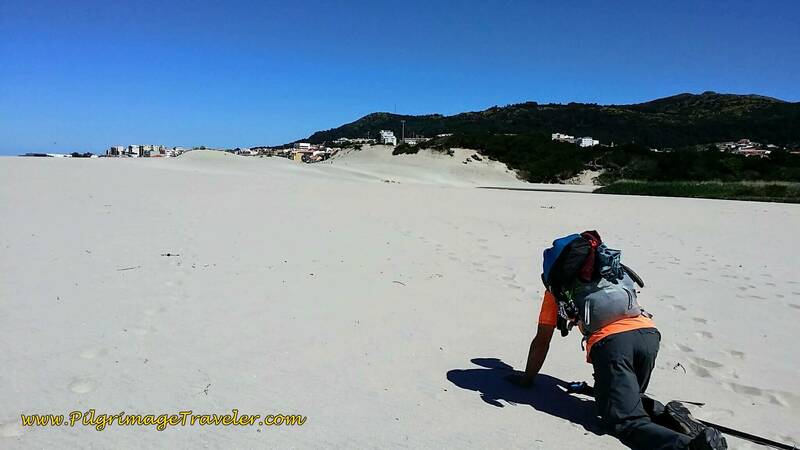 The gravel road continues to the Praia do Marco Branco. The hill of Montedor can be seen in the distance, a prominent landmark, visible for many kilometers. This is our next destination. 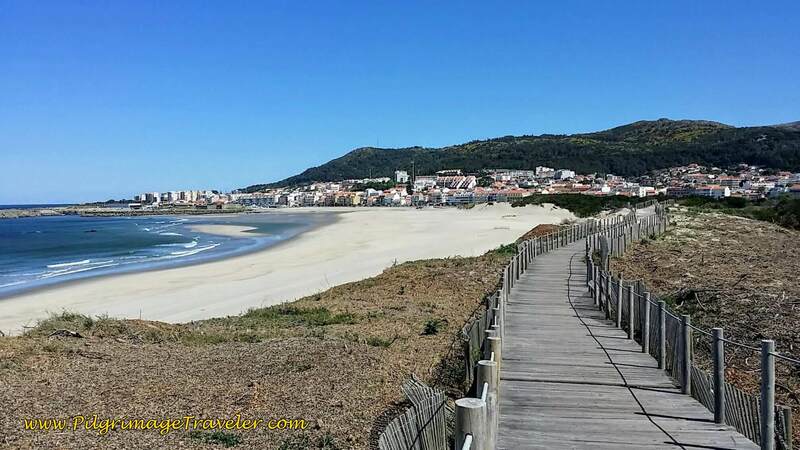 Next is the Praia do Canto Marinho and its long boardwalk. 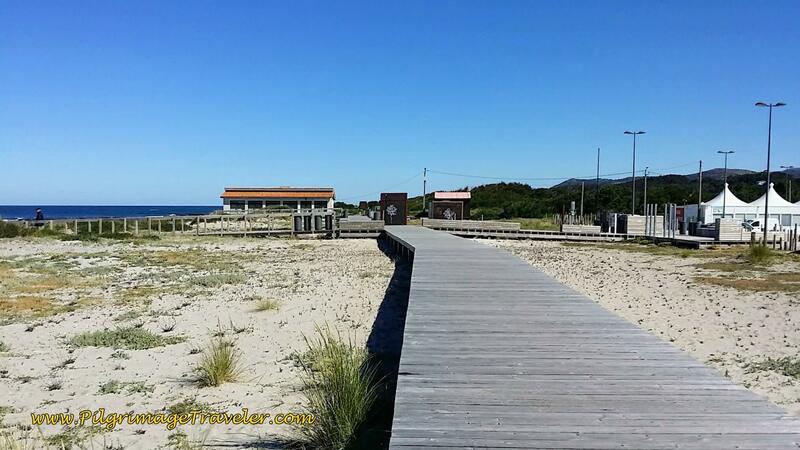 It is almost 8 kilometers (5 miles) into day eighteen on the Camino Portugués, until this boardwalk appears. According to information boards we saw, there is boardwalk construction planned for this entire section to Caminhas. 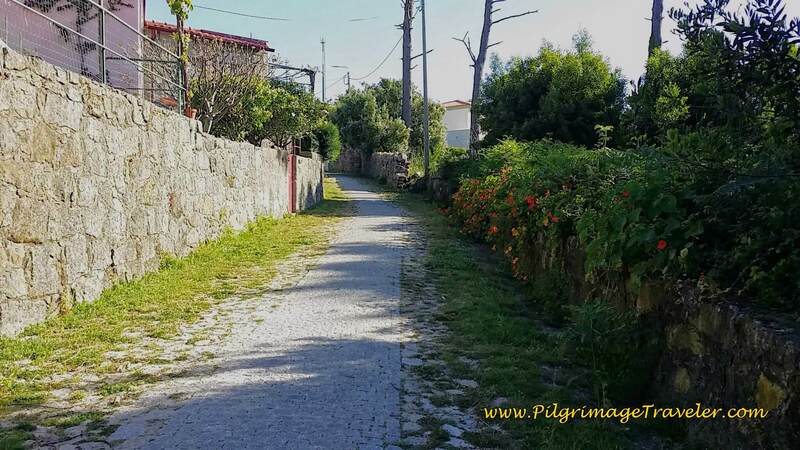 In only a few hundred meters later, you come to a cobblestone road, where the Rua do Lumiar joins the Senda Litoral at a place called Parque and its distinct ruined row houses, below. 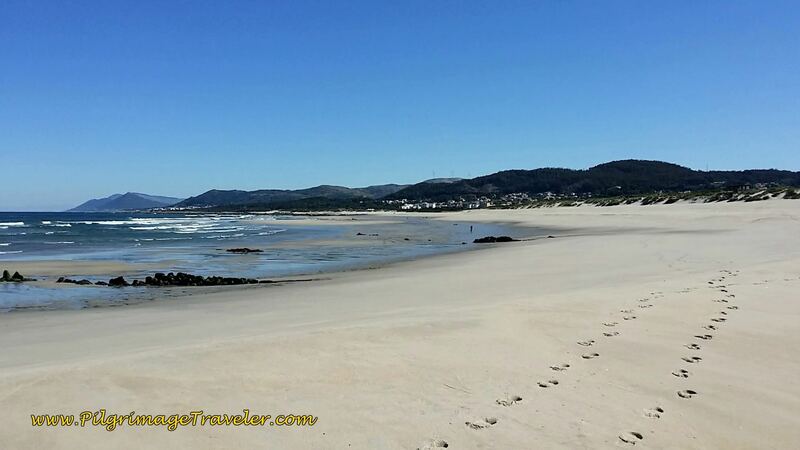 Then walk by the lovely little beaches of Praia do Lumiar after Parque and the Praia do Camarido just before the town of Carreço, shown below. 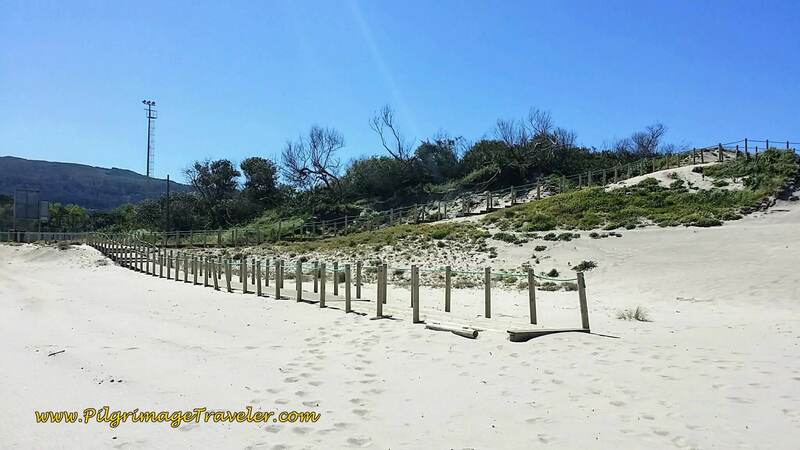 The beach of Carreço, is up and over the dunes to your left and has these beach houses here, all lined up along the Way. We knew we were following the correct way when we came to this signpost for the trail to Afife. The hospitalero had it on his hand-drawn map. 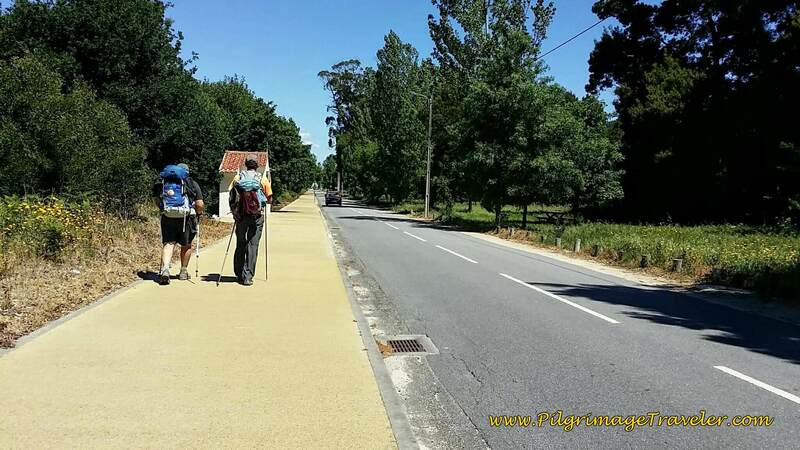 We were only 5.5 kilometers away from Afife on our day eighteen of the Camino Portugués. At about 10.1 kilometers (6.3 miles) into our day eighteen on the Portuguese Camino, we came to a home with a Camino waymark, below. Since the Senda Litoral is not an official Camino, we figured the home belonged to a Camino Angel. It also confirmed again that we were on the correct path. Continue on the Rua do Portinho until it ends at this parking lot, seen on the right side of the photo, below. The trail to Afife takes a right at the parking lot, on this lovely brand-new path, on the other side of the information board. You can also see Roman salt production slabs (Gravuras e Salineiras in Portuguese on the map) on the far left of the photo, if you look closely! It's description is under the little roofed board. Just beyond the parking lot you can see the promontory of Montedor, in the previous photo above, before the path turns to the right and uphill. I inadvertently took a picture of the salt production slabs, as I did not consult my guide before walking on this day eighteen on the Camino Portugues, and didn't know it was there. I got lucky! 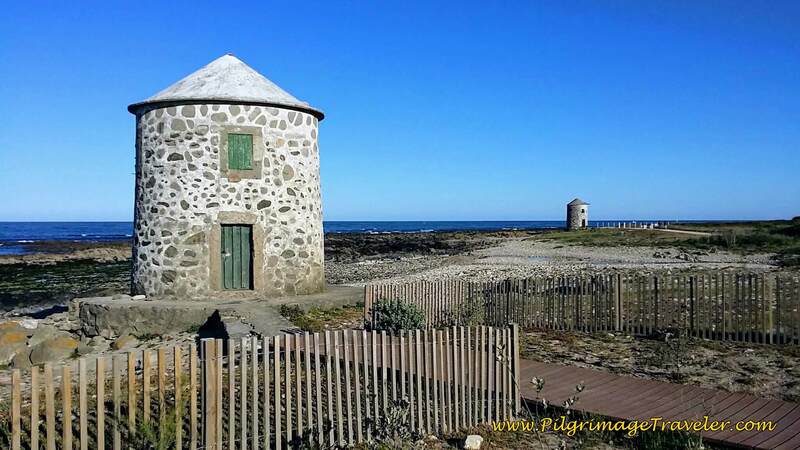 You can create your own Senda Litoral here and not take the path up the hill towards the lighthouse in Montedor, but stay straight along the coastline. It may be a bit trickier to find but is clearly doable and more direct. 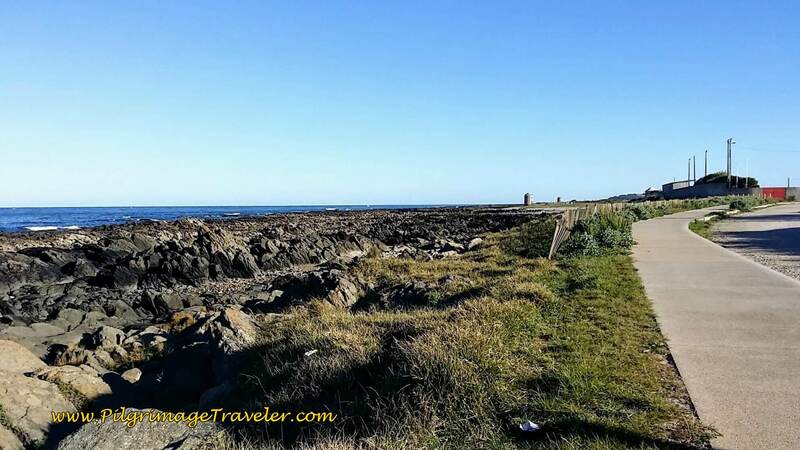 First you have to drop down to Formelos Beach, then climb the rocks on the other side to find a path and more dirt roads to follow the coastline. I can see this clearly when I look closely at the satellite view on Google Maps. This way will eventually join the newly developed path at the small fort, pictured farther below. 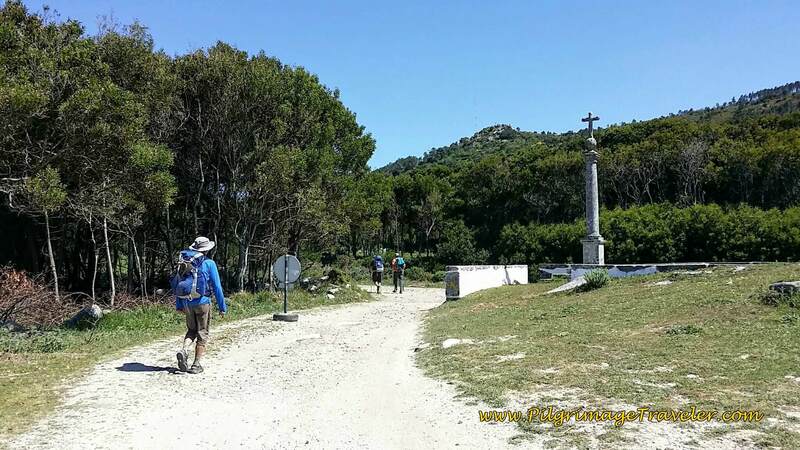 We chose to take the new route, a nice developed path, to the right and up a short ways on a 10% grade towards the lighthouse at the top of Montedor. On the Google map satellite view it looks like we are walking through a field, and not like in the photo, above. 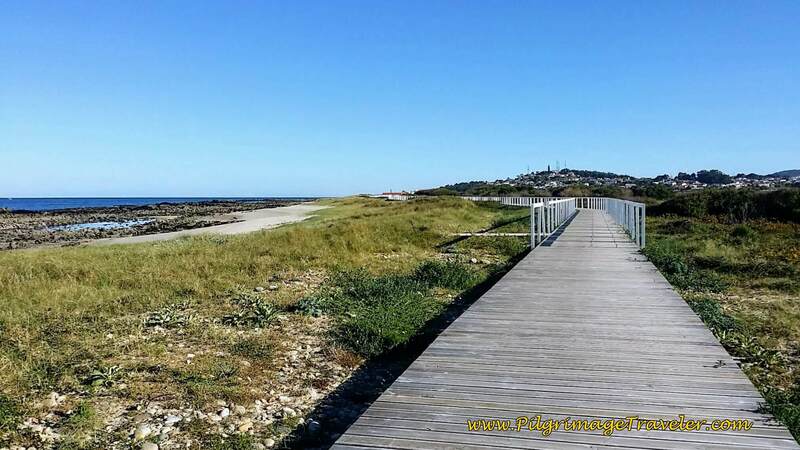 This shows the recent work that has been done on this lovely Senda Litoral! 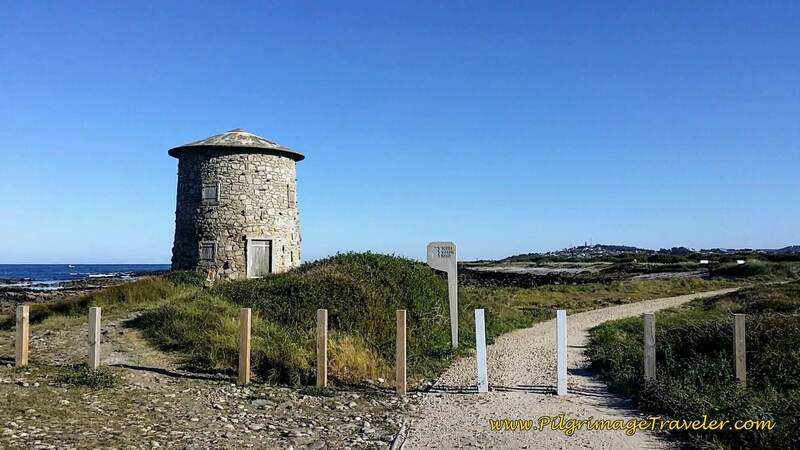 If you chose the more direct path along the beach, keep your eyes peeled for more Roman salt production squares, as it looks like more are present on the Google satellite view, farther along the coastal path before the Pillar at the Promentory of Montedor Beach. 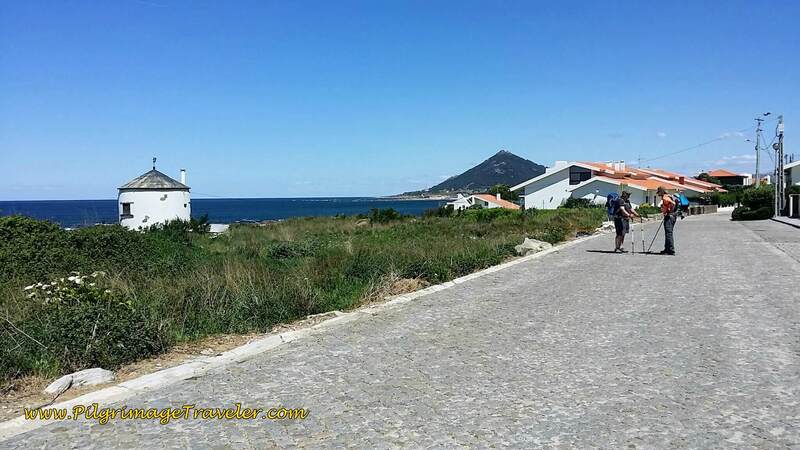 We climbed the hill on the lovely cobblestone path, towards the Montedor Lighthouse. When you come to an intersection, turn right, then a quick left onto the Avenida de Montedor. Along this avenue, we ran into a goatherd (with some sheep too), directing her flock along the road! 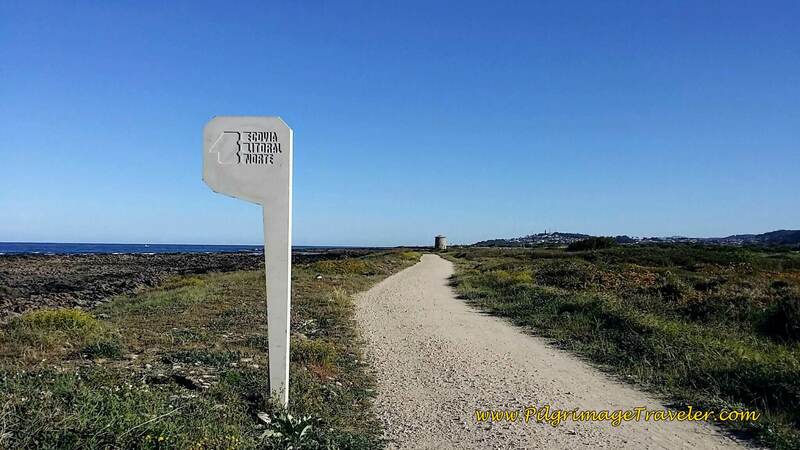 Shortly along the Avenida de Montedor, you will see this trail marker, which says "Trilha do Forto do Paçô," or the trail to the Paçô Fort. This is your next destination. As you can see there is a concrete path that takes you from the tower hill, through the forest and back to the seacoast. It is a new, well-developed way. You cannot get lost! From the top of the hill, the view is lovely, and worth the climb up it! You can see the small fort in the distance. The concrete path winds around at the bottom and takes a long way around via a big loop, before becoming a lovely boardwalk. We could see ahead where to cut through the field to chop off a bit of this sauntering path, and land on a small beach cobblestone road on the other side of the field. We skirted by the fort entirely. We thought it was time for a mid-morning food break, and who did we see on the other side of the fort, lounging around, but Steve, our British friend! We joined him to sit on a sea wall by the Praia do Paçô, and have some food from our packs. It was a nice respite. Back on path towards the sea, after the fort, Steve joined us on our journey. 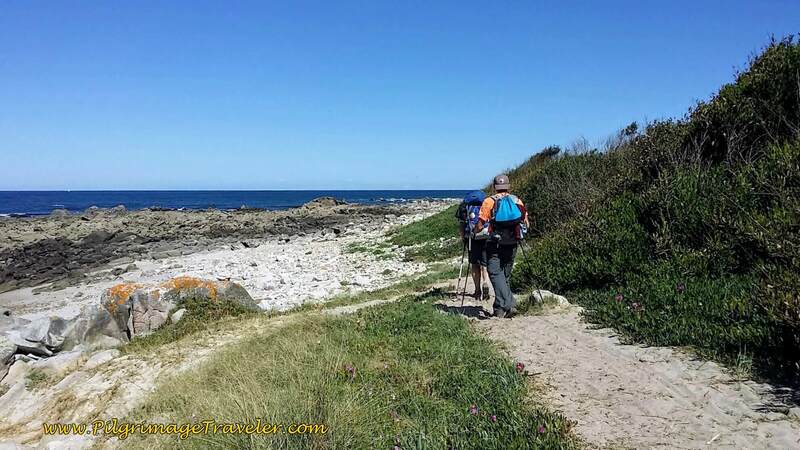 As we followed the path, in only about 300 meters, it drops you onto the long and lovely Arda Beach. 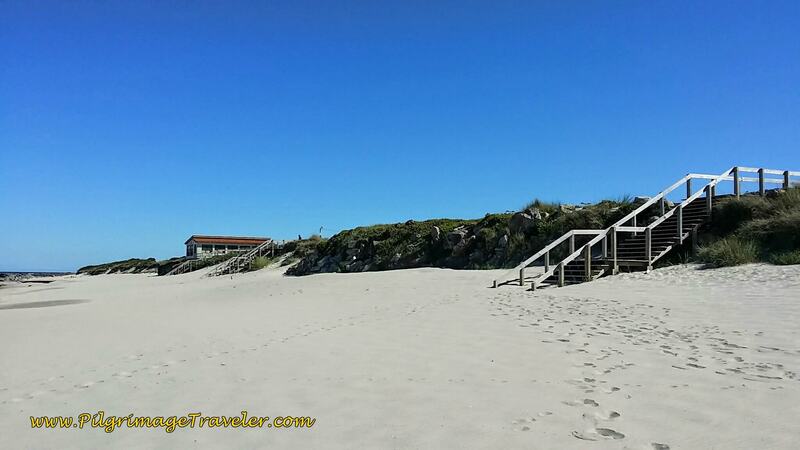 If ever there was a dream of yours to hike on the beach, this is the beach to do it on! 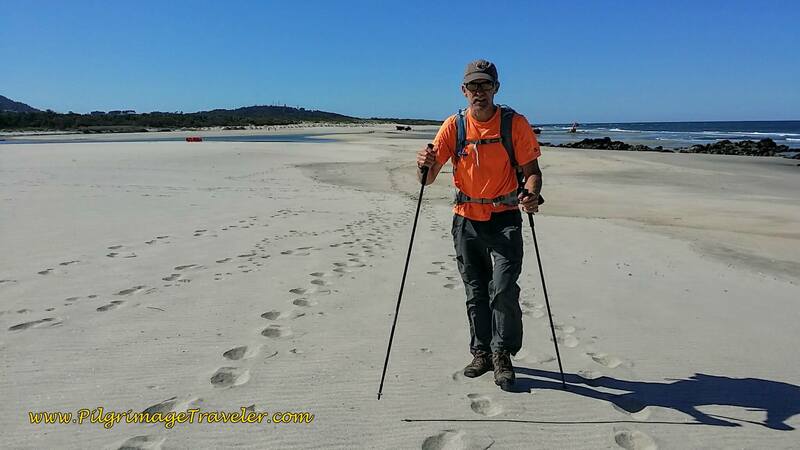 The sand is well-packed, flat and so easy to walk upon! Steve and Rich on the Long, Flat, Lovely Packed Sand to Walk Upon! After about a full 2.5 kilometers on the Arda Beach, look out for several sets of stairs to buildings and to the boardwalk. This is your escape route. This is now Afife Beach and you will see buildings appear, signaling an established beach with facilities and a parking lot. You could actually continue longer on the beach if you so desired, but I wouldn't advise it, because not much farther on the beach all but disappears. 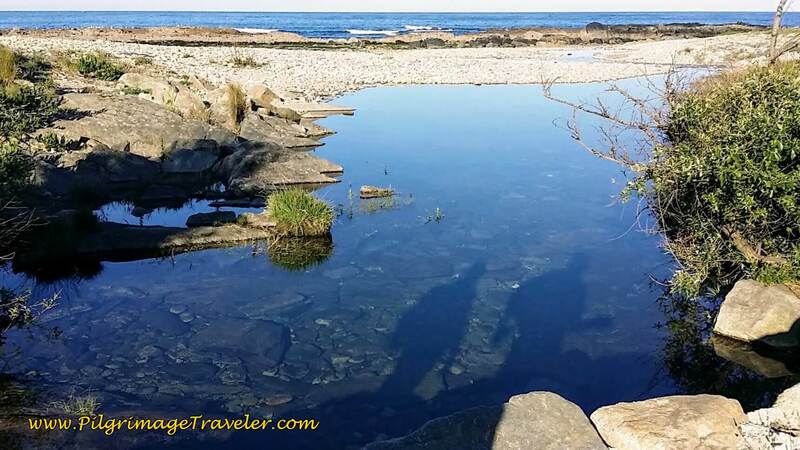 Unless you like to pick your way along the rocky coast, it is better to walk on the boardwalk now available to you. Plus we were following the scribbled out map from the hospitalero who advised us to take the stairs here! So we believed the local advise was the best advice to follow. Literally, we had no idea where we were going, but we were indeed, able to find our way, as the quote above says. Perhaps it is better to not know and make your way as best as you can! More lovely boardwalk is available through the marshes. When the boardwalk ends, turn to the right to find a road just ahead. We had to go around some construction at the time of this writing, but that may be gone when you are here. The paved road is the CM1162 and we followed this until the pavement ended. 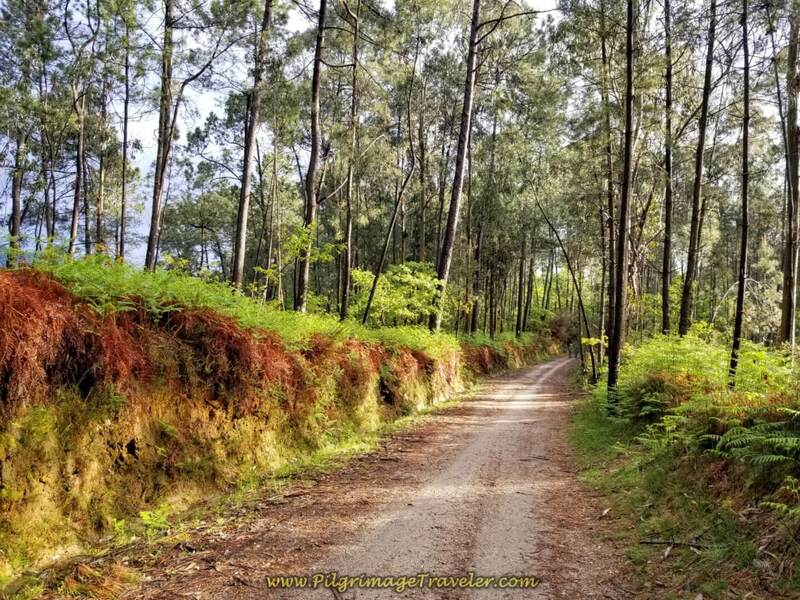 We turned right onto the dirt road, then immediately left into what the hospitalero called "a one-man trail into the jungle to walk for 30 minutes." We found this trail easily, and after an initial walk through a field, it did walk us through the woods on a single track. This distance through the "jungle" is about 600 meters at best! And then the trail directly dumps you out onto yet another beach, the Praia da Gelfa. 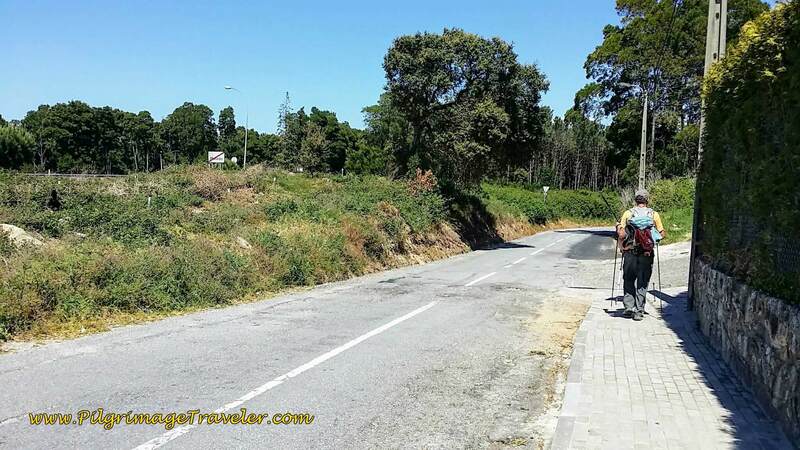 We caught up to Michele, the Frenchman near here, and I had him pose by the signpost, letting us know that it had been 2 kilometers from the Afife Beach to the Gelfa Beach. 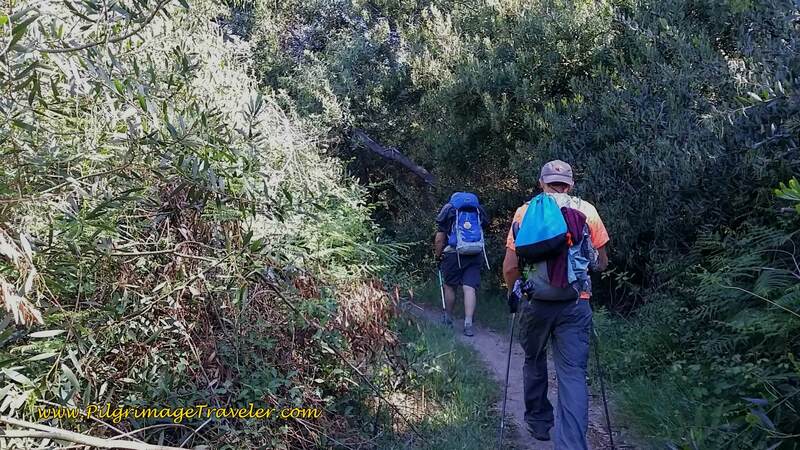 This is a more established trail that we had been on, and better than we were led to believe! 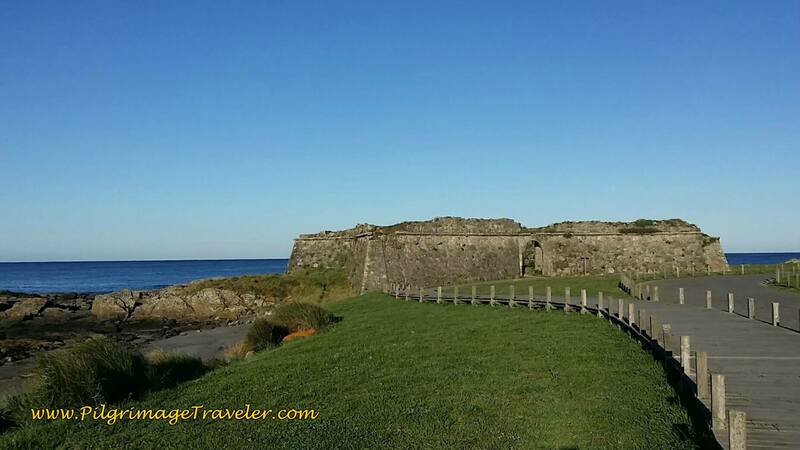 This trail led us to another seacoast fort, the Forte do Cão. It is over 2 kilometers from Afife Beach to the Fort. ...until it ended at a parking lot, and we saw yet another boardwalk system to follow, below, towards the city of Âncora, ahead. 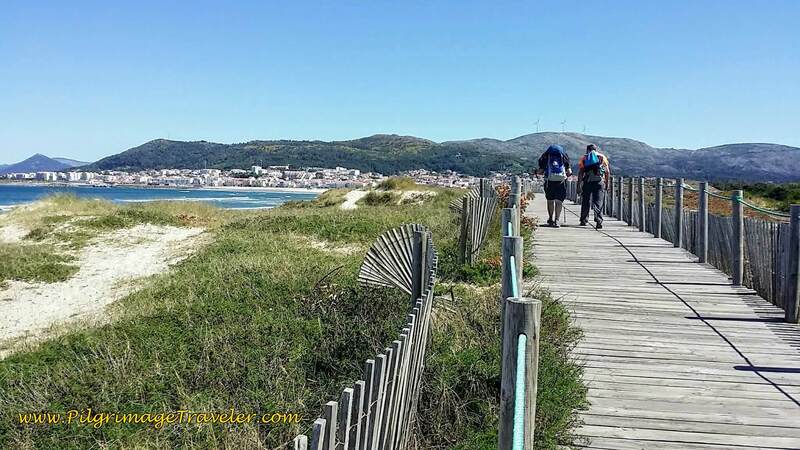 This boardwalk was lengthy, about 1.5 kilometers with views of Âncora ever present ahead and the Praia da Duna do Caldeirão (Caldron Beach Dunes) ever visible on your left. It was a gorgeous place to be walking. And then suddenly the boardwalk, turned right, went down a dune, looped hard left and ended! Here is a look back at this zig zag. The next boardwalk we could see ahead, across a vast stretch of sand and at the top of the next dune hill. Whoa! We had no other choice but to cross this great divide! We did cross the dune, and here's Rich, always the character, making the best of it! Ha ha! 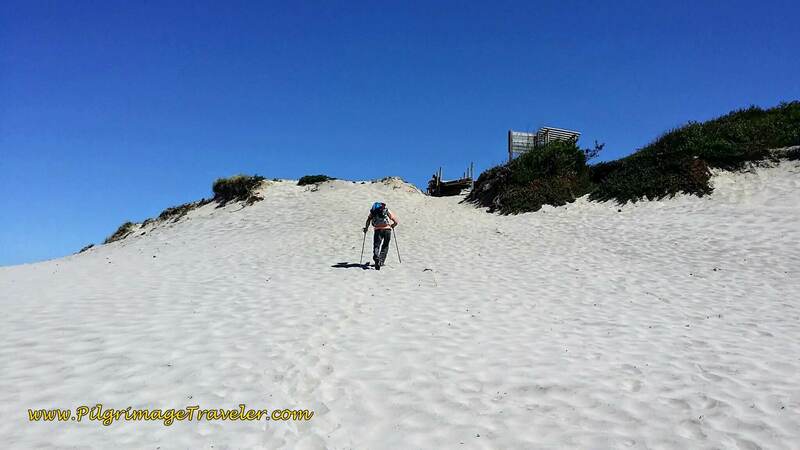 Rich Crossing the Caldron Beach Dunes on Hands and Knees! We did actually have to hike up quite the dune to get to the other side and to another boardwalk system, below. It was actually quite strenuous, despite my husband's shenanigans! Fortunately it was only a short distance. Apparently, most of this section is often under water, as the satellite view of my Google map, above shows. 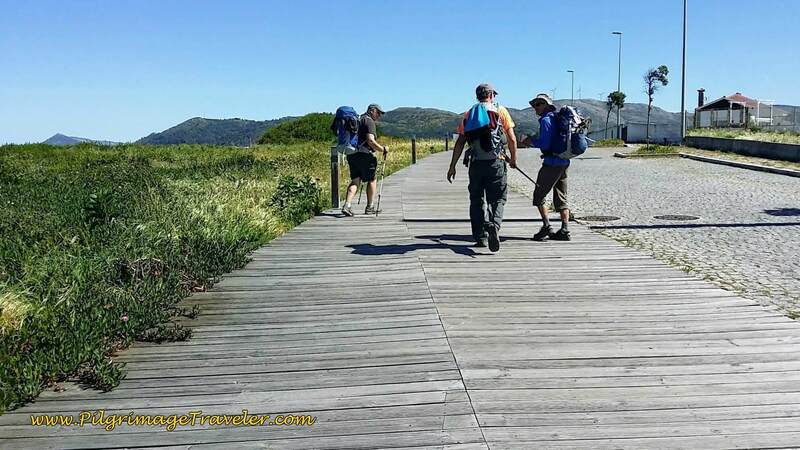 We joined the boardwalk to cross a bridge across the Rio Âncora and found ourselves on the seacoast promenade of Âncora. 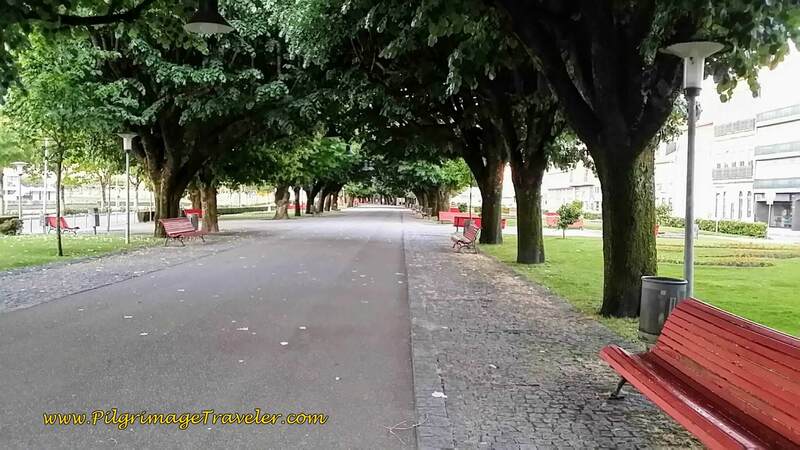 It is about 2 kilometers from the Forte do Cão to this promenade on the other side of the bridge. 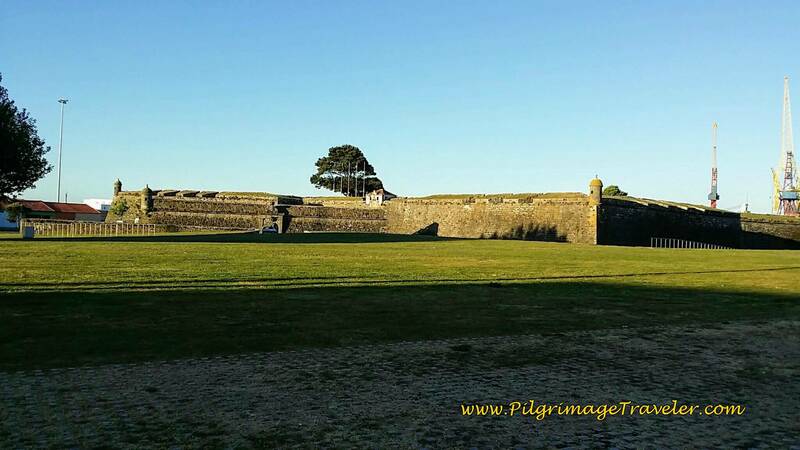 Strolling along the promenade, the road winds around the large fort called the Forte da Lagarteira and joins the Avenida Campo do Castelo. 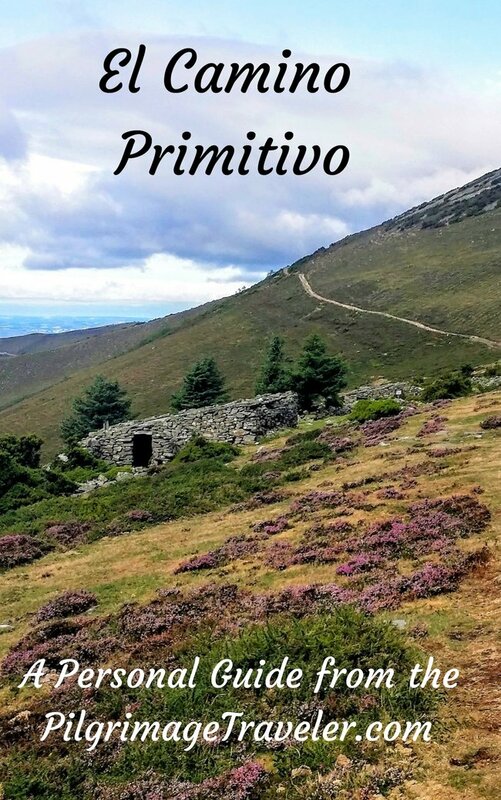 By the time you reach this fort, it is about 19 kilometers into your day eighteen on the Camino Portugués. You are more than two-thirds of the way! Less than 10k to go! ...until the Avenida bends right, but we stay left on the road along the coast. 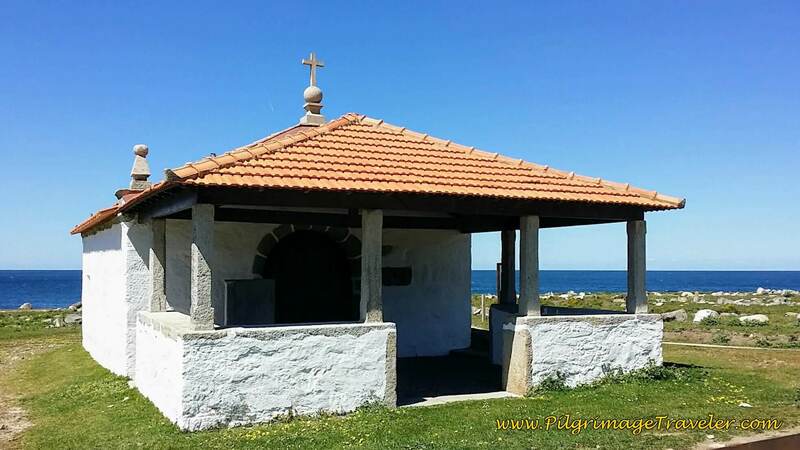 In a short distance, we passed this lovely little chapel, the Capela Santo Isidoro. In a few hundred meters more, the road bends inland a bit at this cross, the Cruzeiro de Santo Isidoro to follow the railroad tracks. 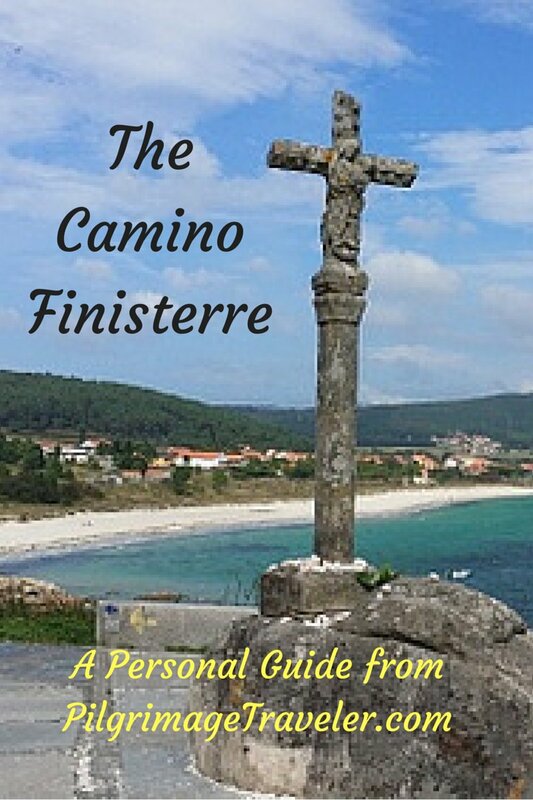 If you haven't yet had enough beach walking on day eighteen of your Portuguese Camino, you could create yet another personal Senda Litoral, by turning left, towards the sea, just before this cross, to join a dirt road that follows the coast more closely, and eventually meets up with the Coastal Route in the town of Moledo, a mere kilometer or so away. 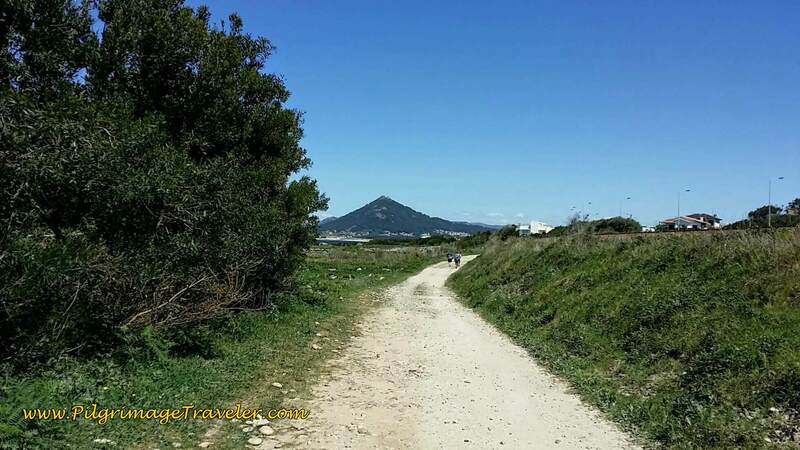 And around the corner, Spain is visible ahead, at a prominent landmark, the Monte de Santa Trega (Mount Tecla), seen in the photo below. 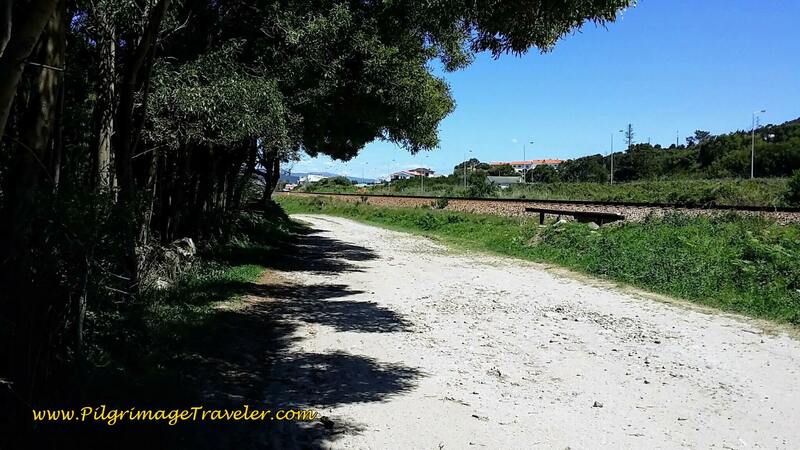 The gravel road beside the tracks becomes cobblestone and is the Rua da Estrada Real as we walked toward the next town of Moledo. Here Steve and Rich pause to wait for the psycho-journal-person to catch up! As usual, whenever Rich walks with another male, they tend to pick up the pace. It was a bit annoying, but I just lolly-gagged along at my usual pace! We had lost Michele, who wandered off to find a place to buy bread. 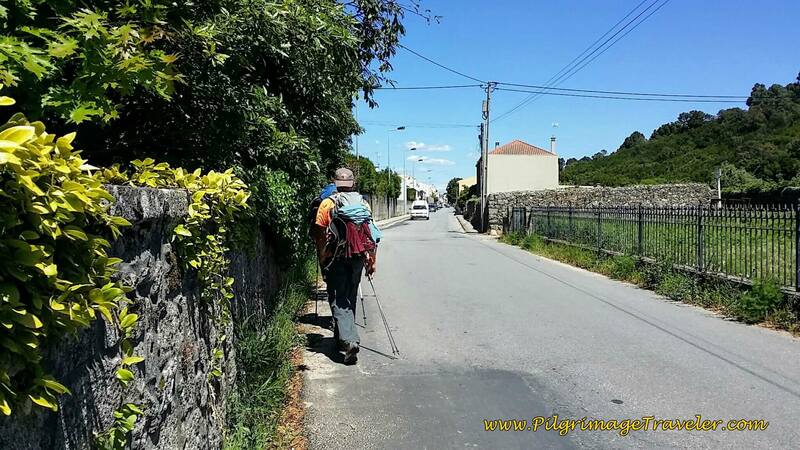 He would not accept food that we offered from our packs, but insisted that all he eats is bread and cheese on his Camino! Wow! I was a bit worried as he wandered away in town - he looked like he was going to bonk. He is a thin man, and didn't look like he could afford to go without food for long. 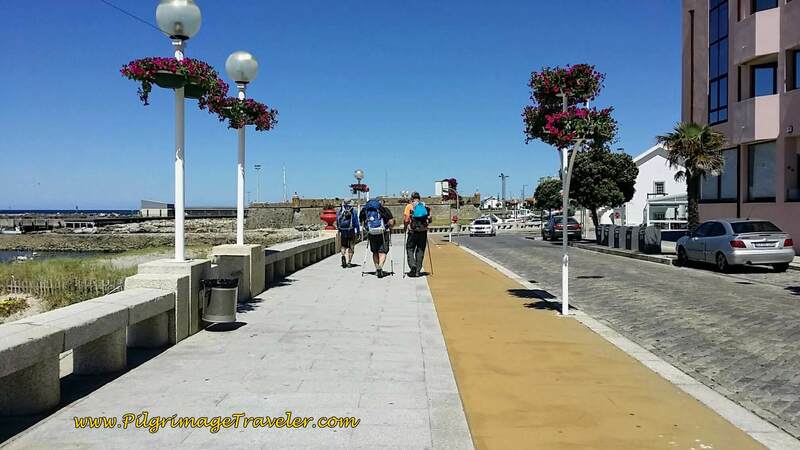 Just before Moledo, on day eighteen, the Caminho Portugués da Costa takes a final jog toward the beach. I was tired and hungry after more than 10 more kilometers from our last stop. 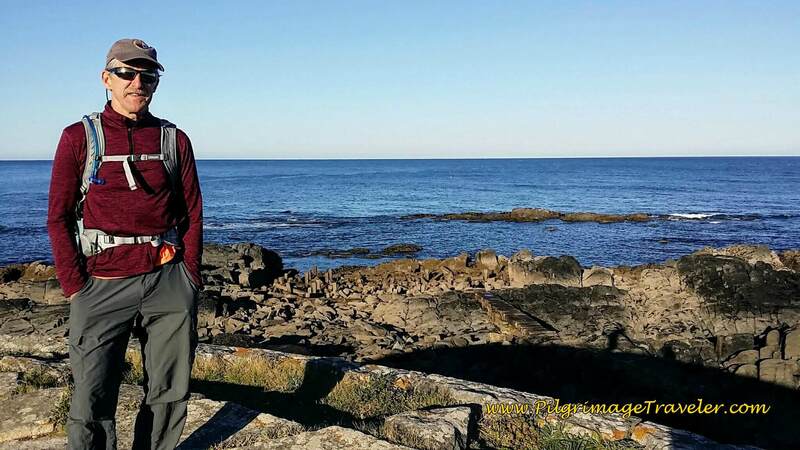 I talked the gentleman into stopping a final time by the gorgeous rocky seacoast, below to have a bite of tuna and crackers. Neither one wanted to stop, but I insisted. If we were to walk the coast, then I wanted to enjoy it and not rush on by. The gentlemen conceded and we had a lovely break as we viewed the Moledo Beach and pondered our next day's foray into Spain. 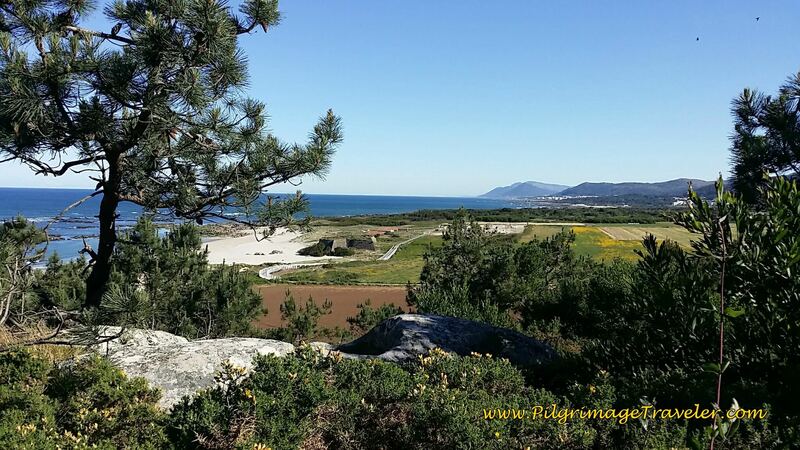 The Monte de Santa Trega was in full view from this beach. 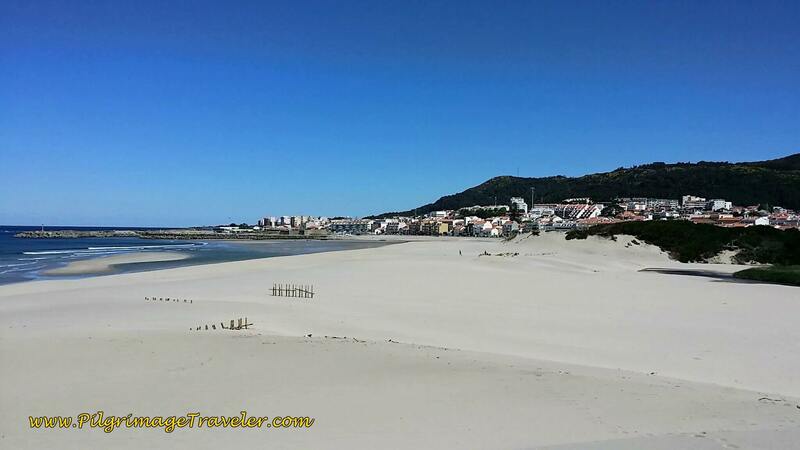 And after a short reprieve on the lovely beach, we turned inland once again to join the Avenida Santana in Moledo. Yellow arrows were now abundant, appearing frequently. 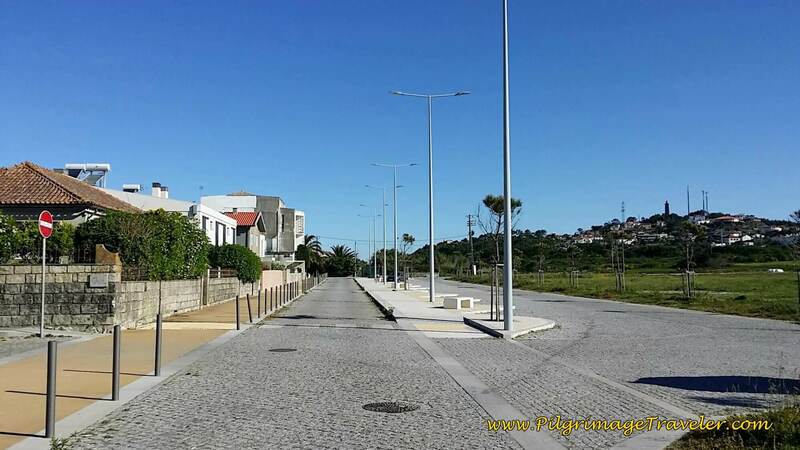 300 meters onward and through town, we came to a large roundabout, taking the 3rd right and turned onto the Avenida da Senhora ao Pé-da-Cruz, below. This road essentially parallels the busy N13, on much nicer and quieter pavement. 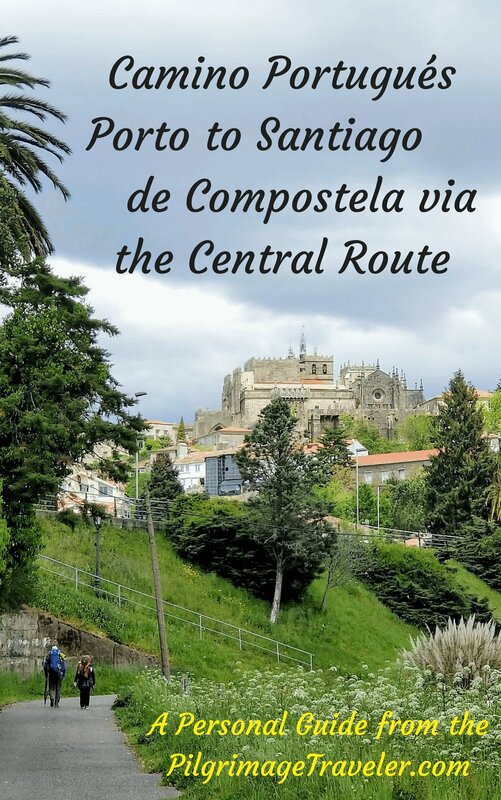 It is a straight, long shot from here to Caminha. Shortly, a yellow bikeway begins along the Av. da Senhora ao Pé-da-Cruz on the final stretch to Caminha. This section felt really long, hot and hard to me, as my feet were pounding the pavement! As is always true, for me, the final kilometers are always the hardest, and I am the most discouraged. 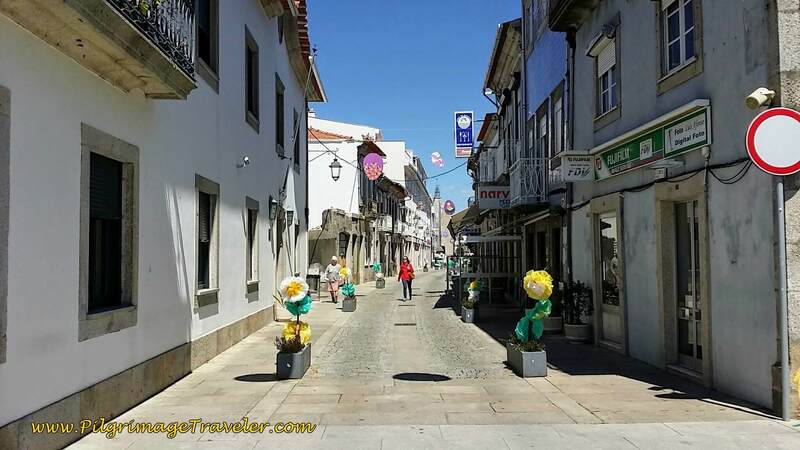 We walked onward, for another 1/2 kilometer, when the yellow path ends, and the street crosses the railroad tracks and becomes the Rua do Pombal, pictured below. 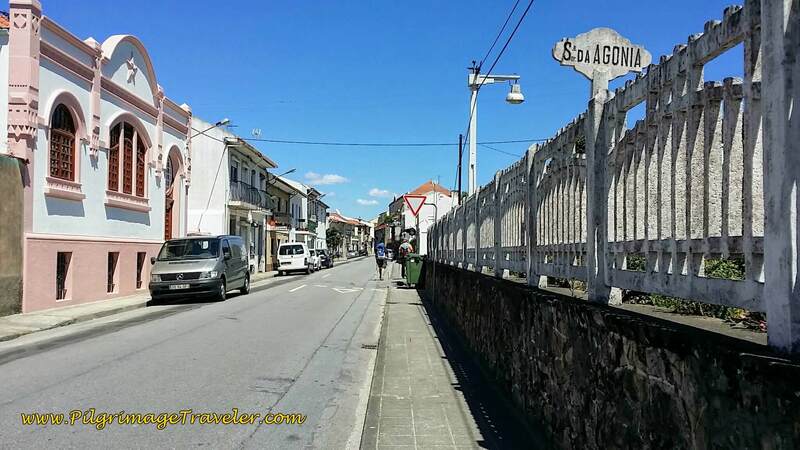 In another 2ooo meters or so, walk by the Senhora da Agonia train station, shown below. Continue straight on, where the street becomes the Rua Benemérito Joaquim Rosas. ...that takes you the famous landmark, the Clock Tower or Torre de Relogio (in Portuguese). 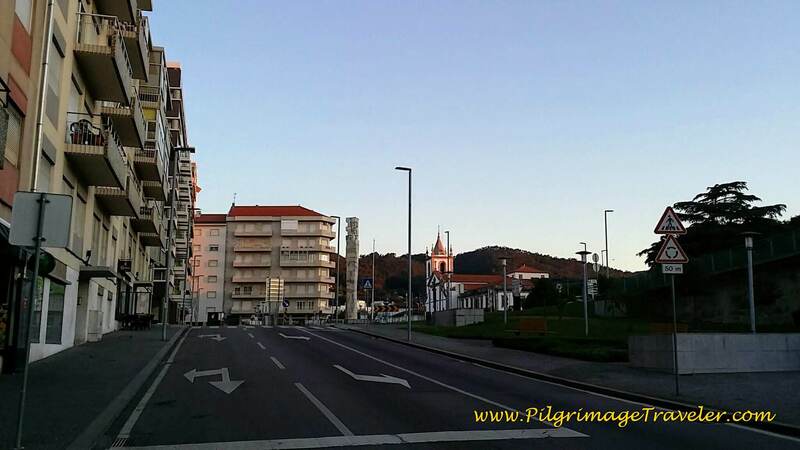 My GPS said it is about 4.5 kilometers or so from Moledo to this town center of Caminha. We walked on by the obvious town square, to look for the albergue. We walked by the church, the Igreja da Misericórdia, below. 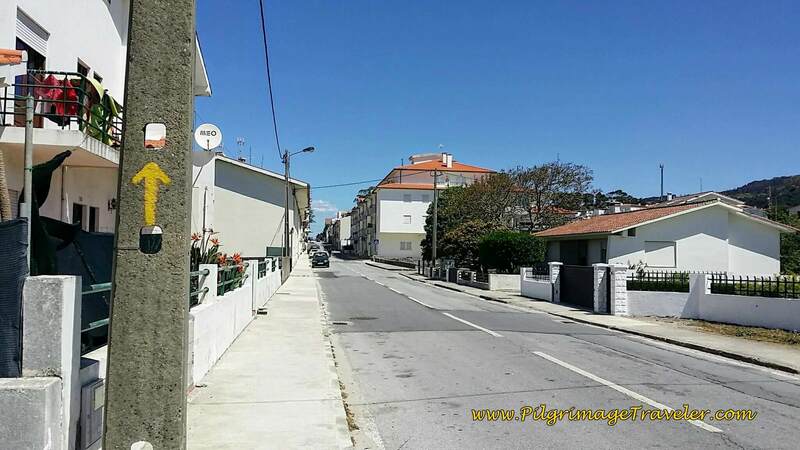 A right turn, after the town square, onto the Avenida Manuel Xavier, and then a left onto the Avenida Padre Pinheiro, and the sign for the Albergue de Peregrinos de Caminha appears. The albergue opens at 2:00. We arrived at 2:09. There is a number to call on the door, which we did. A woman came to let us in and show us around. I knew immediately that I was not going to stay here. It was in the basement of the building, below a kindergarten child care center, and it smelled too musty for my taste. Everything there looked bare and minimally accommodating, and at 5 Euros, you get what you pay for. We chose instead to book at the Residencial Galo d'Ouro, an old, yet charming and clean family-run hotel, just steps south, from the main square (see the Google map above for its location). 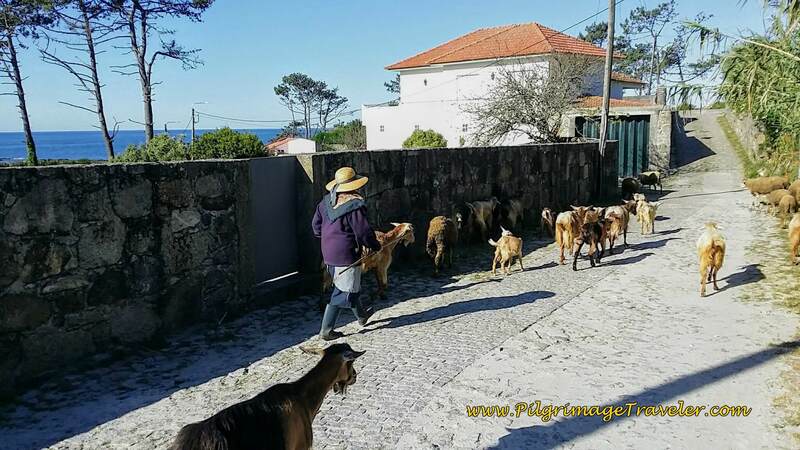 The proprietress was the usual ultra-friendly and helpful Portuguese woman. 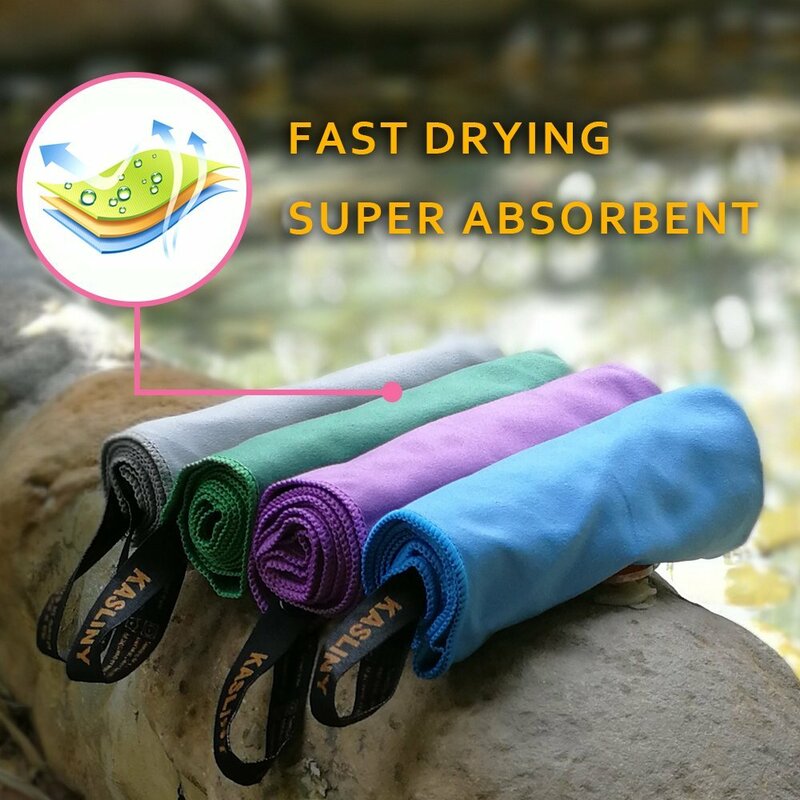 She even offered to hang our clothes after washing them if we needed. We paid 40 Euros for two, no breakfast included. 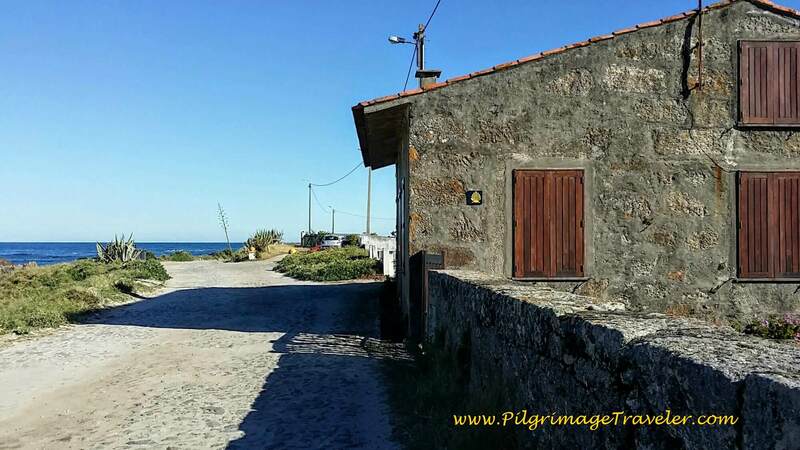 We were so glad we chose the Residencial, because we were told by other pilgrims that not only was the albergue stinky, but there was no hot water, and the lights in the shower were on a timer and kept going off every 10 seconds! Our friend, Yanni told us she felt like she was in a big open gas chamber! Egads! 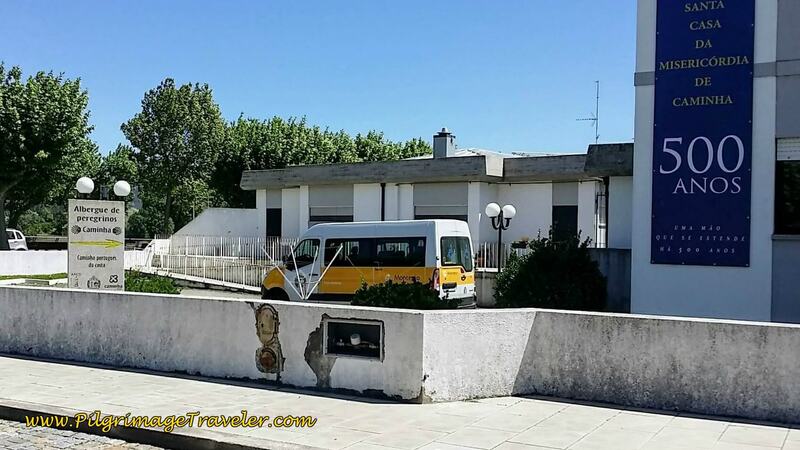 If you want to check out other possibilities for accommodation in Caminha, click here. After securing our place, we joined Steve, our English friend, and hung out at the Café Central, in the Clock Tower Plaza, watching one pilgrim after another stumble into town. We spied a young dark-haired woman, looking around and we waved enthusiastically for her to join us. When she approached the table and smiled, I realized that I didn't know her! I later asked Rich and Steve if they knew her, and they both said, "I thought YOU knew her!" Ha ha, we had a great time getting to know Lisa, from Germany! Later on the trail, I told Lisa that we all thought we knew her when we waved at her in the square. 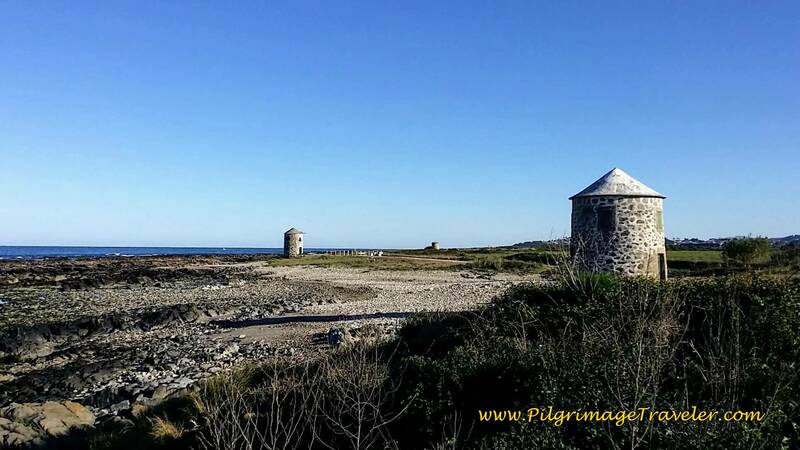 She said that she didn't care, that she was very happy to join other pilgrims! 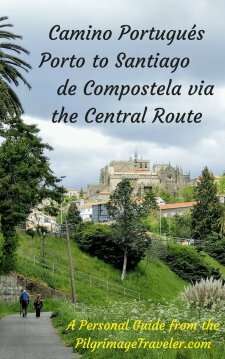 Nowhere else but on the Camino would this happen! 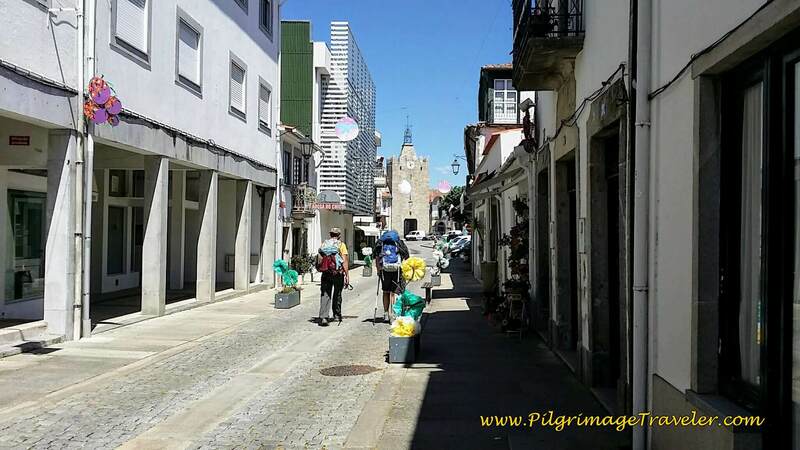 After a few beers, a shower and reconnecting with other pilgrims, we walked around town, a bit to see the few sights. 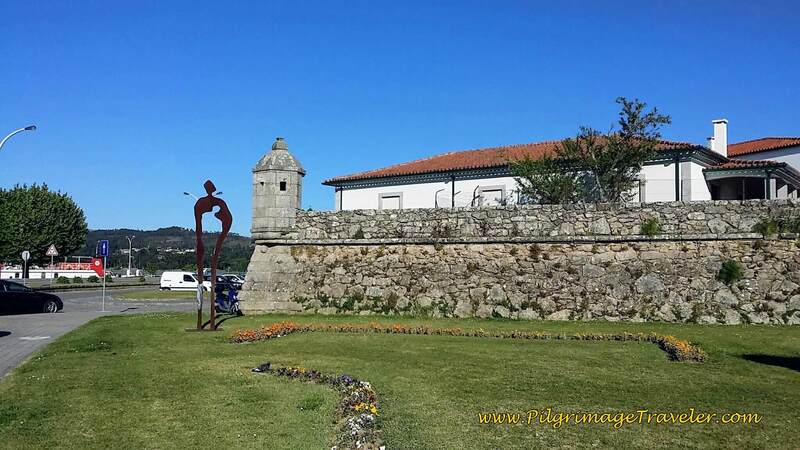 The old walls of the town, called the Muralha de Caminha, can be found at Praça de Espanha, on the waterfront by the central plaza. 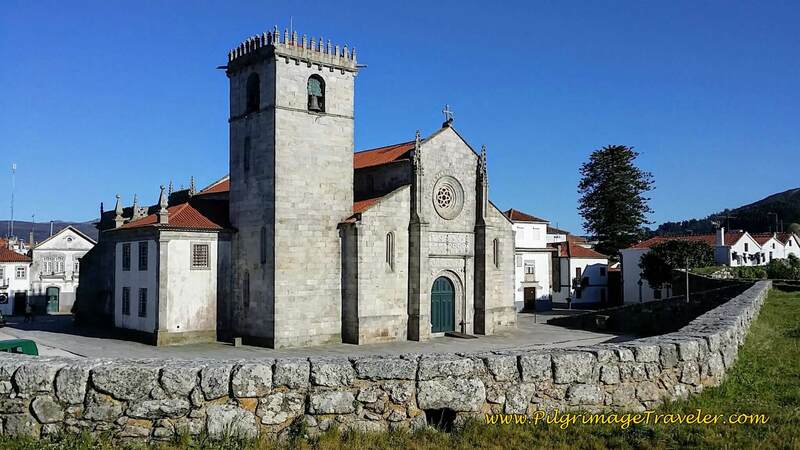 By the fortress walls, is the Igreja Matriz de Caminha, below. It was fun to walk on the walls, and look northward to the River Minho, the dividing boundary between Portugal and Spain. We walked over to the ferry that evening, to check out the schedule for our ride across the Minho River into Spain in the morning. The ferry was not running, because of too low a tide, that would persist until morning! Our options were to wait who knew how long for the tide to rise (they told us 2:30 p.m.), walk a really long way around, catch a bus/train or find Mario, the fisherman who would take us across in his small fishing boat. 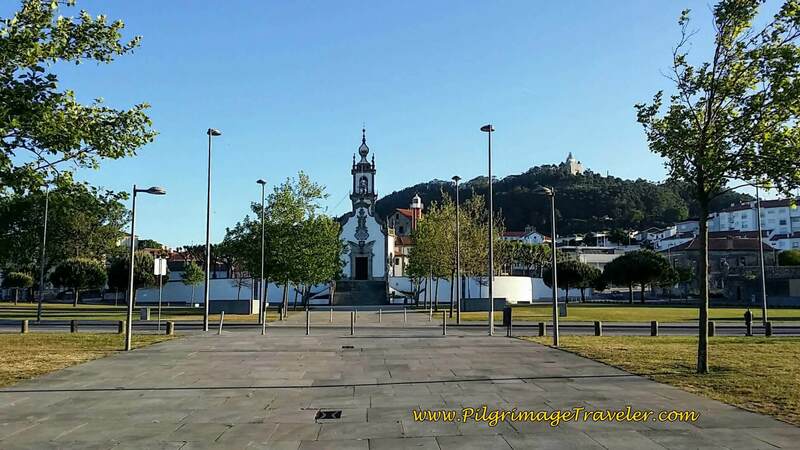 We talked to some British folks at dinner at the the Duque de Caminha Restaurant (behind the Clock Tower, where we had a fabulous meal), and they said they visited the tourist office and were given the number to call Mario! They had already arranged for a time for their boat ride in the morning. We decided to wait until morning to call and make the arrangements. See day nineteen for our adventure! 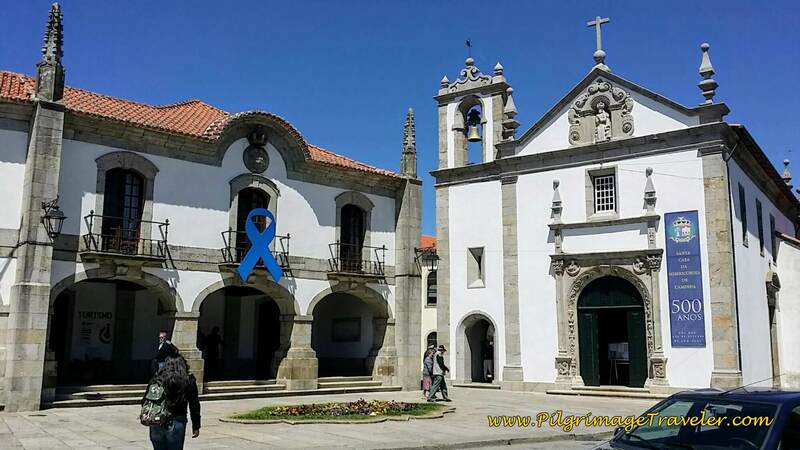 My advice for you is to go to the tourist office when you arrive in Caminha. Check the ferry situation. Get the number for Mario there, to be sure the information is current. There may be more people ready to give you a ride and/or different numbers as seasons change. (As of this writing the number for Mario was (00351) 96-341-6259.) Mario charged us 5 Euros for the crossing. I had only to reflect on the beauty of this day's walk. It was a glorious day, in all ways, walking along with friends and making footprints in the sand. Occasionally, though, I did notice emotions bubbling up to the surface. I was not sure why, but I would just let the tears flow. It was very cleansing. We stopped at zero cafés on this day. We actually never saw any along the way, or perhaps we never even looked for one. 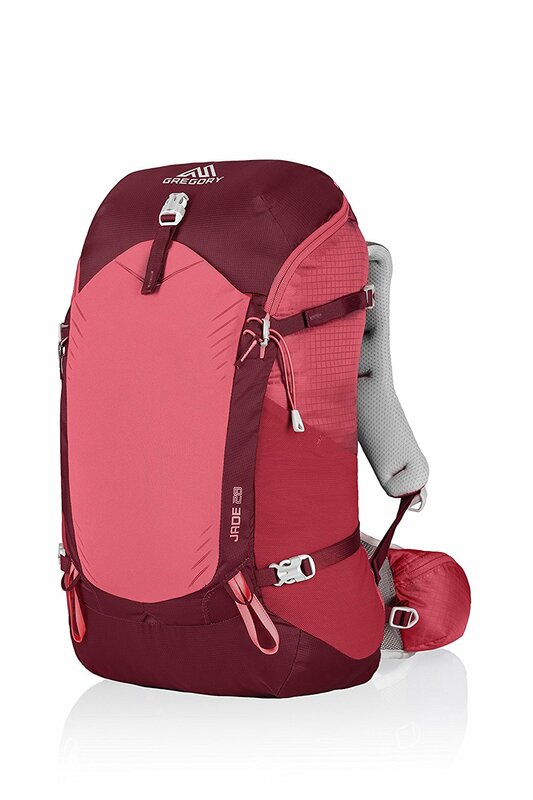 We had two breaks, both along the seacoast, having food from our packs. For some reason, I didn't feel I needed coffee. It was invigorating enough to have my breaks next to the sea! It was amazing how incredibly easy this day was, compared to what we were led to believe by the hospitalero. 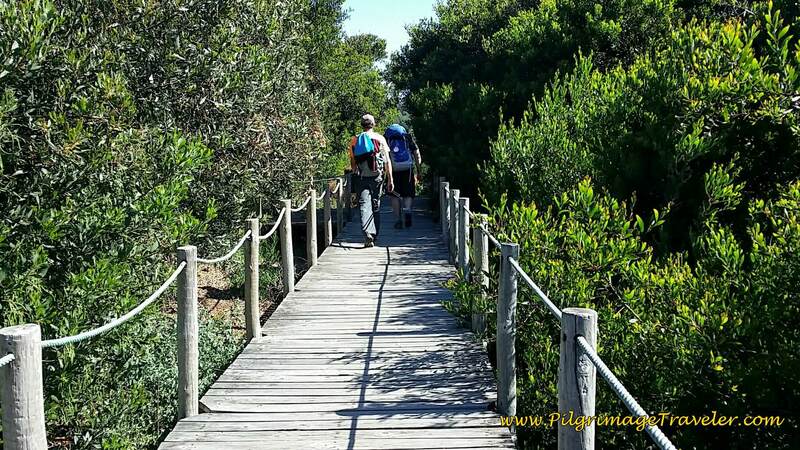 The instructions we received were essentially good, and most likely, in a few years there will be no need to route-find, as a completed boardwalk system will greatly enhance the ease of walking here. 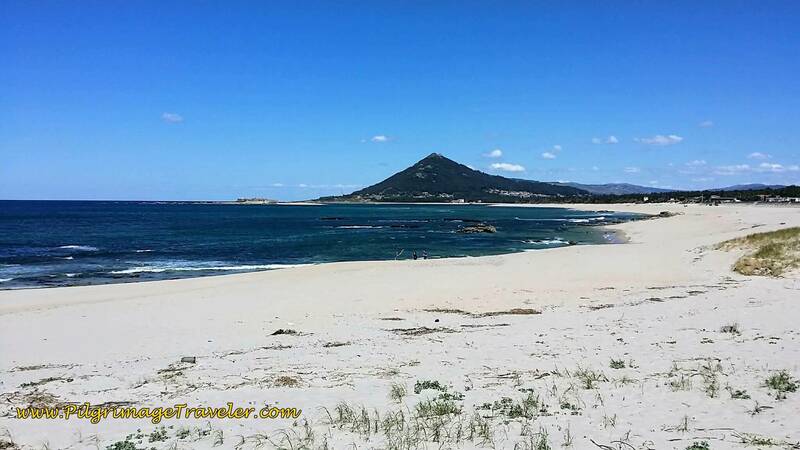 But do, by all means pick a beach to walk upon, as it is a fabulous way to experience the Sendal Litoral on your day eighteen on the Camino Portugués. 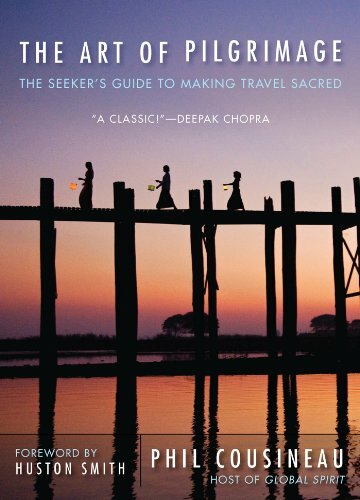 May you find your own way, by losing your way on the Senda Litoral on your own day eighteen on the Portuguese Way! May you leave many footprints in the sand!